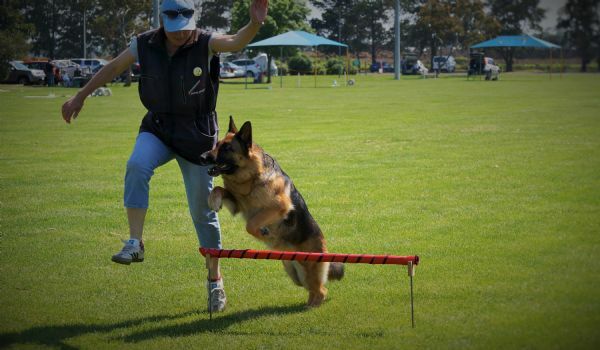 Training me is not an option, it is an OBLIGATION. 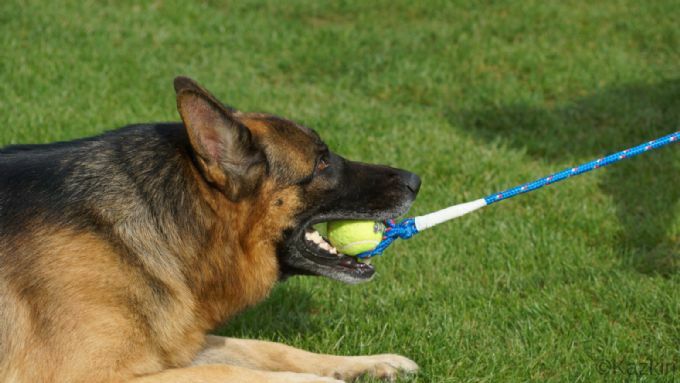 it is how to prevent problems starting. 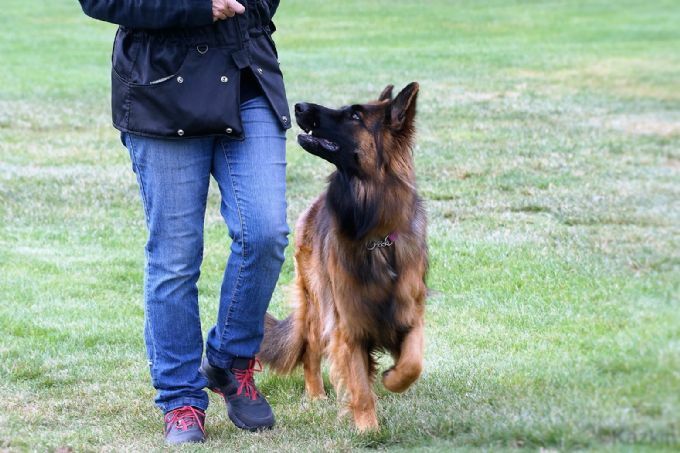 When the puppy is very young, up until 12 weeks, training is mostly in the form of games, but the pack instinct is at work, so that co-operation with, & dominance by, humans is learned. 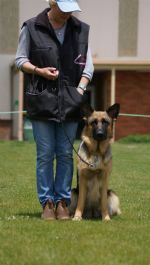 Basic obedience such as "sit" & "heel" can begin to be taught, & house training commenced at 8 weeks. The acceptance of restraint is an important lesson, particularly with large males, & should be learnt by the age of 12 weeks. 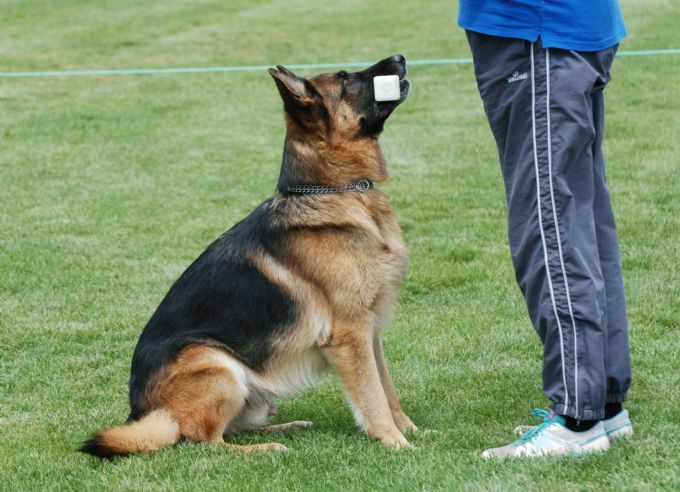 Restraining the puppy involves holding it firmly on its side, where it cannot get away. 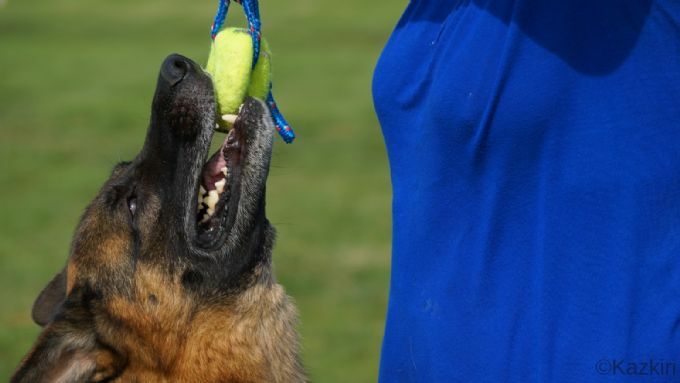 This is a short lesson that needs to be taught, on a few occasions only, until the puppy realises that you will not let it go until it stops struggling. 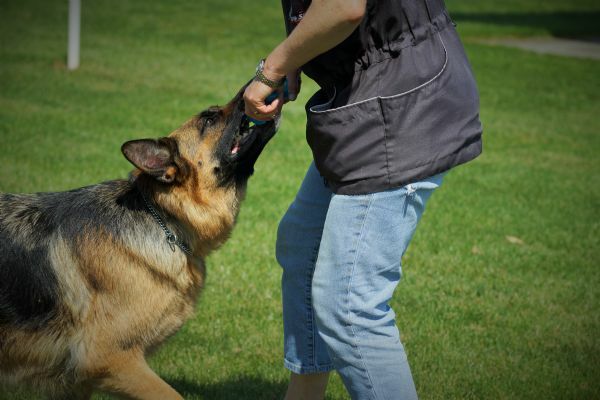 Use this method when a puppy gets over-excited & starts to get nippy or when holding a puppy to cut its nails. 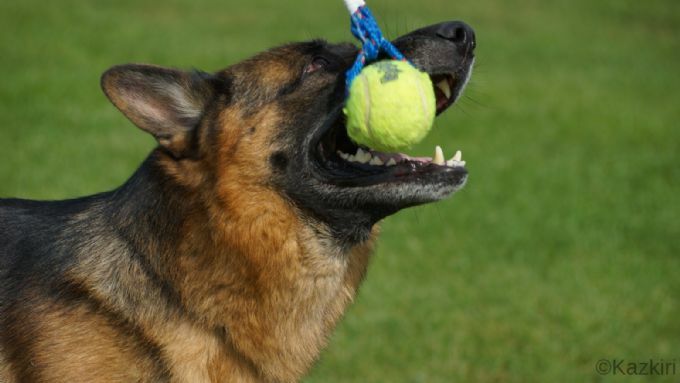 All that is required is that you hold it firmly until it calms down. The puppy may scream & shriek, wriggle like a worm or try to bite, but if held firmly (NOT in a death grip !) 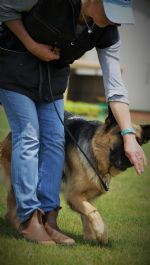 next to your body with one arm over its body & the other around its neck, slightly stretching the head forwards, the puppy cannot hurt himself or you, & will, after one or two minutes calm down. 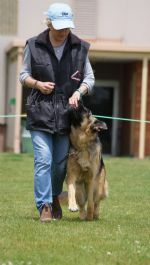 When it is calm, ease your grip, speak words of praise,& stroke & pat the puppy, then release him. 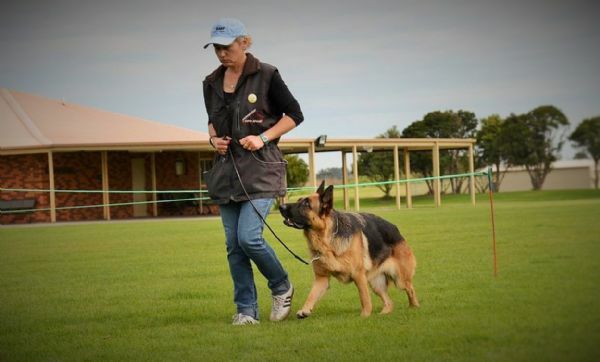 This only takes 2 or 3 lessons & it is learnt for LIFE. 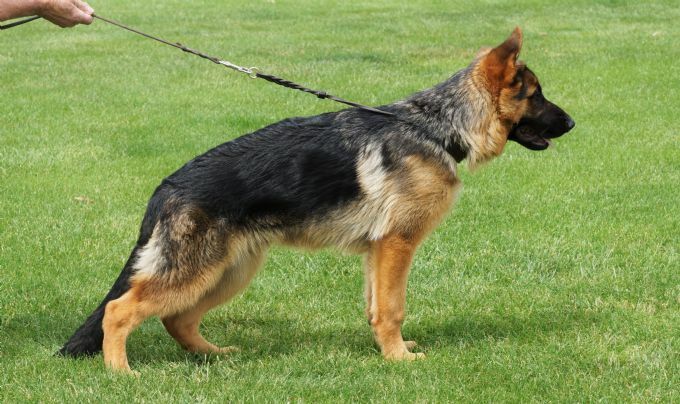 Holding a puppy on its side until calm when it is under the age of 3 months is an extremely valuable lesson in restraint. 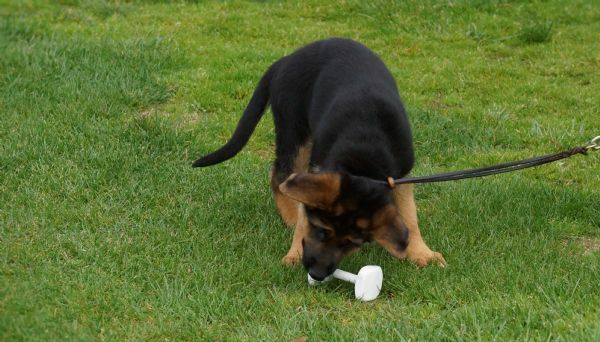 12-16 weeks is a critical stage of learning in a pups life. More formal obedience training should be commenced, as this is the ideal age for transition from playing to discipline training. 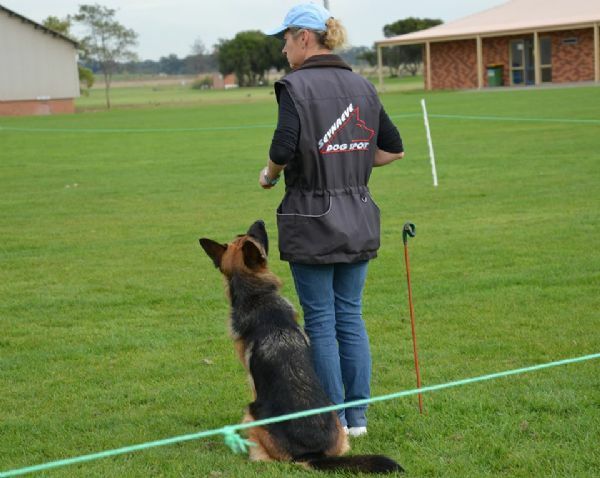 Training lessons should be limited to 10-15 minutes maximum, as the attention span is still not very long. 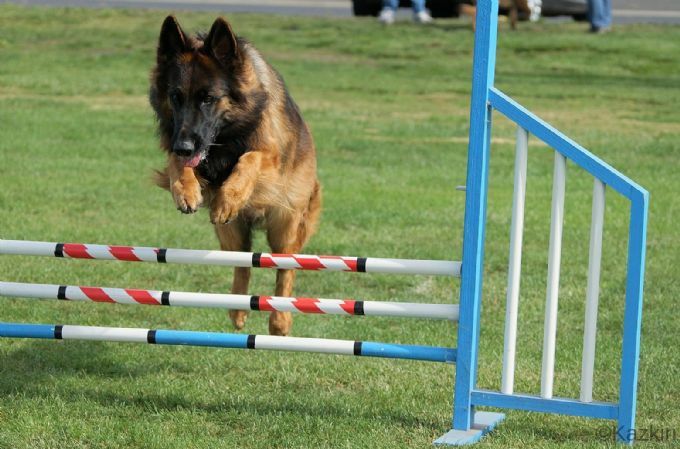 It is better to train twice per day for a short time than try to do too much at once. Some puppies particularly males, may try to see who is boss - NEVER lose on that point. 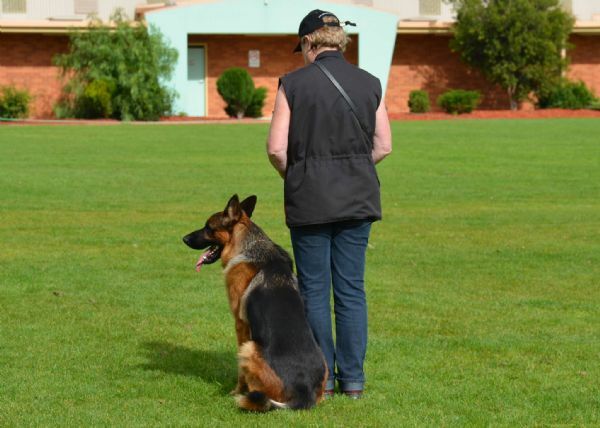 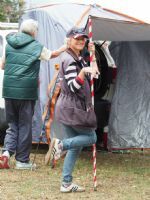 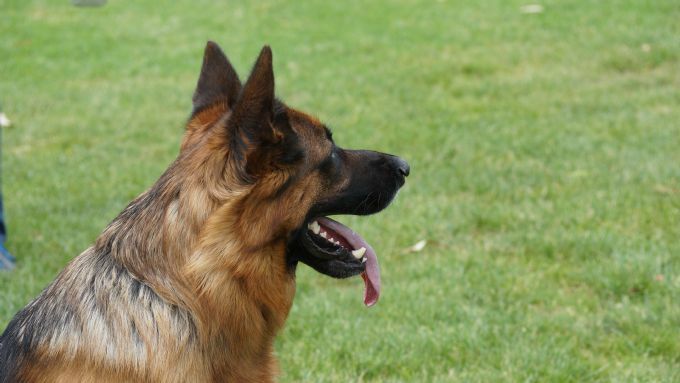 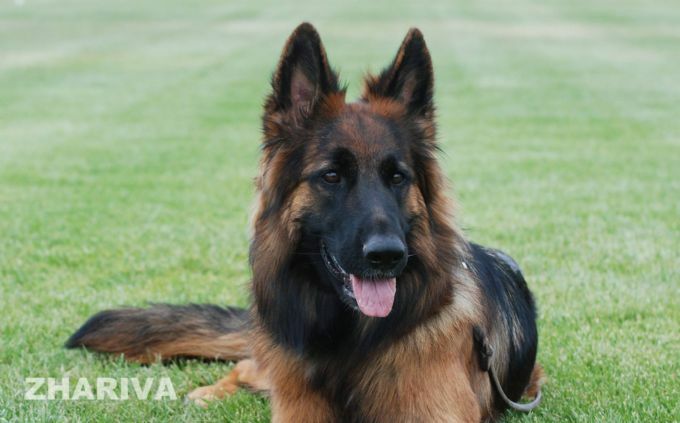 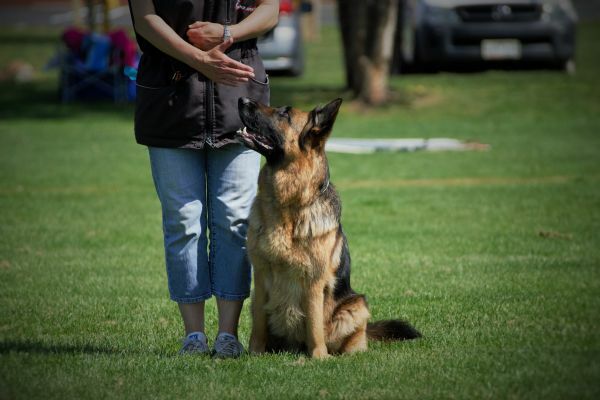 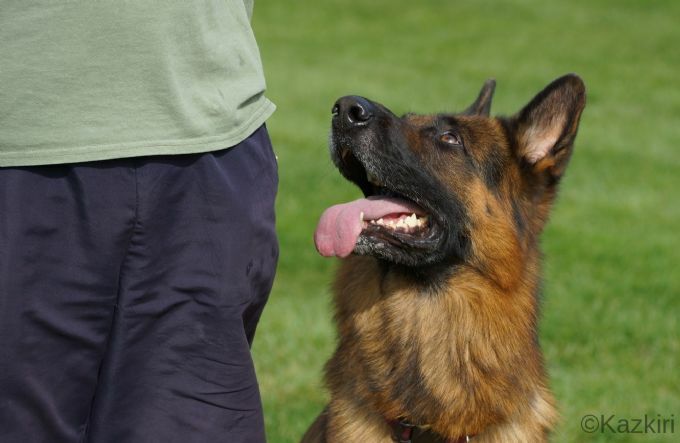 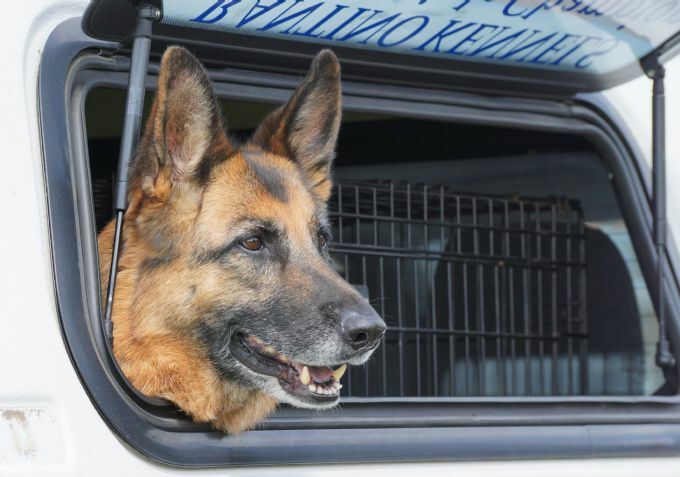 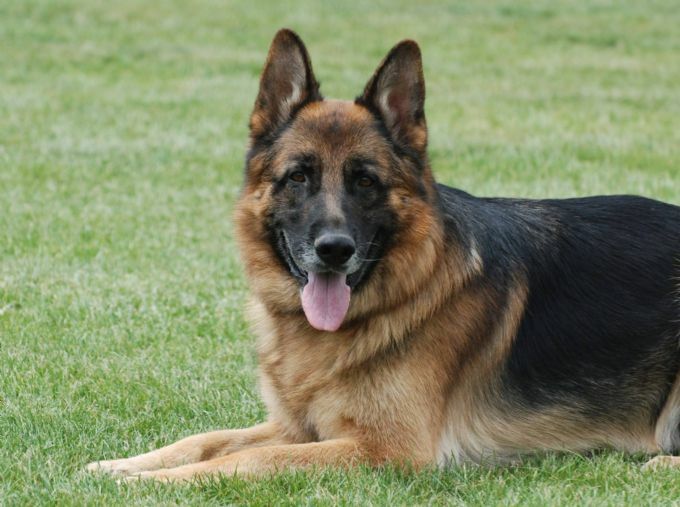 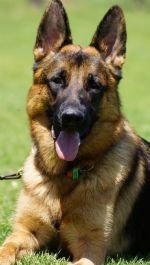 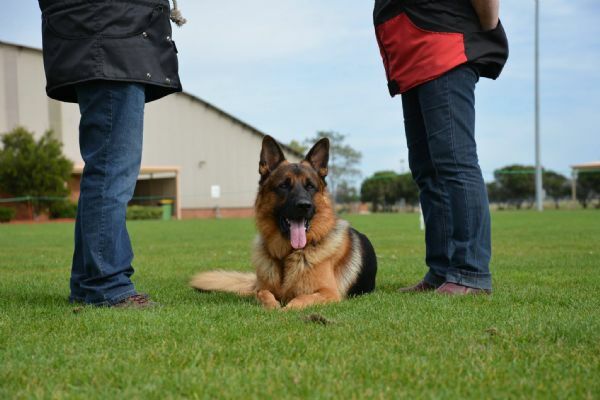 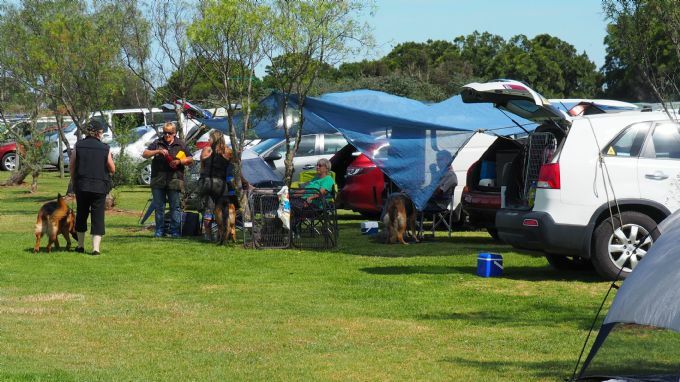 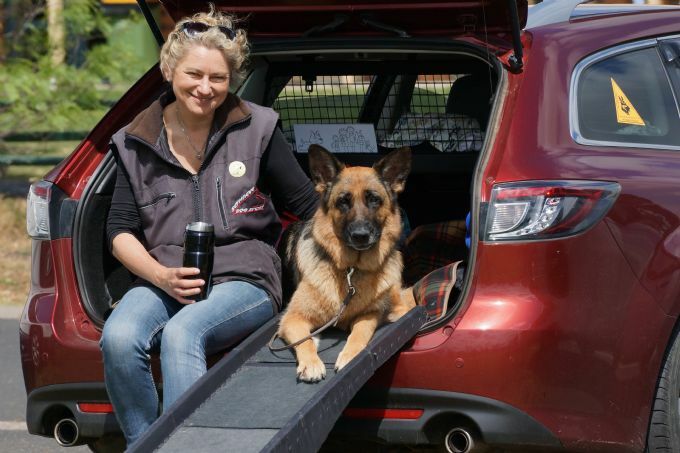 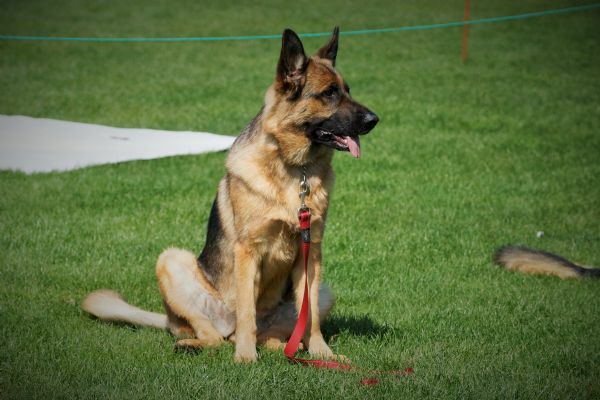 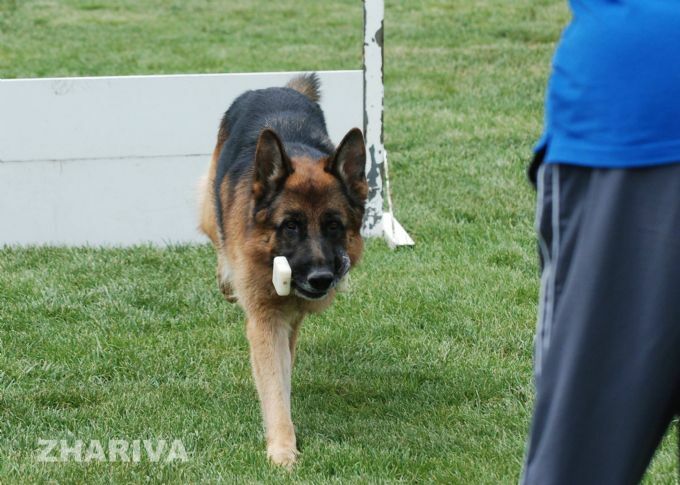 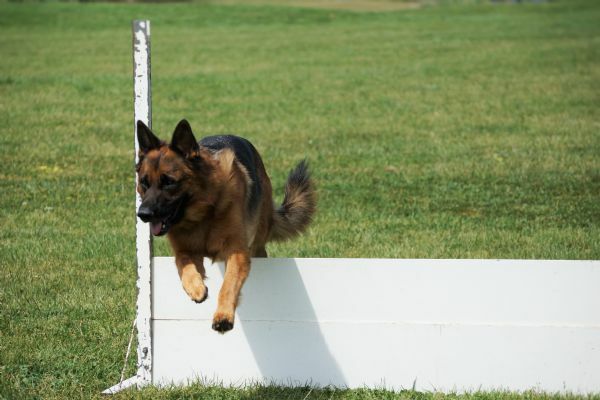 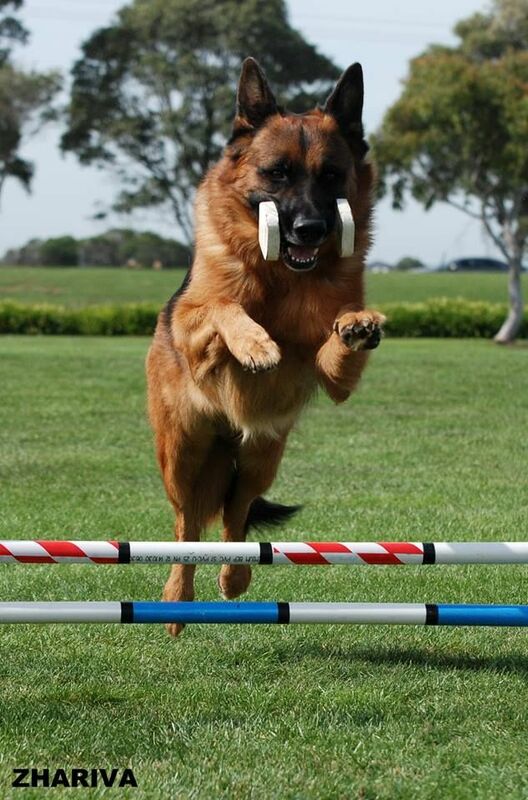 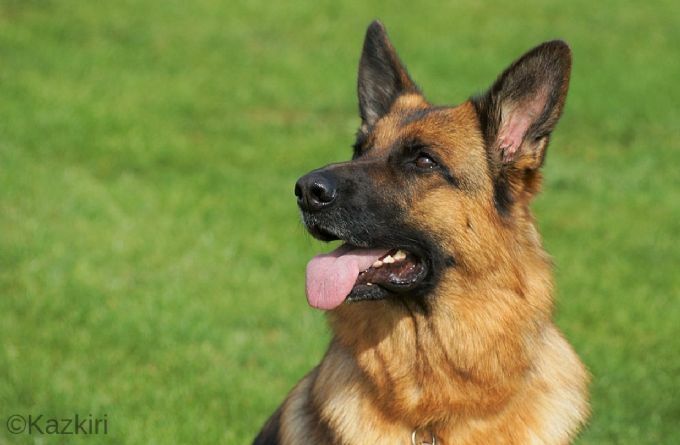 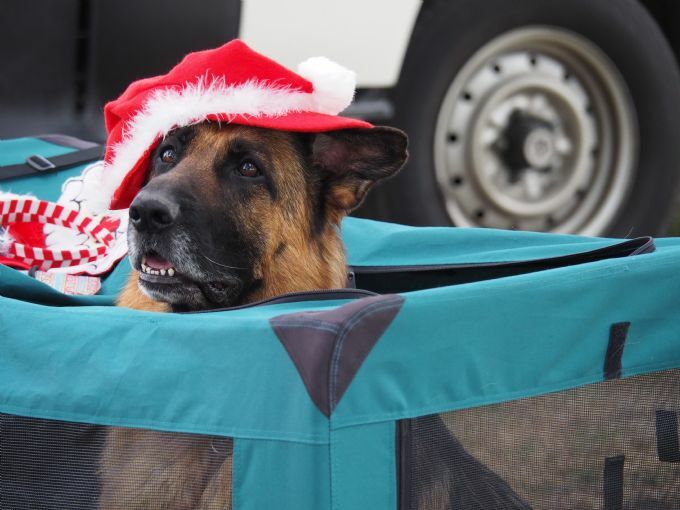 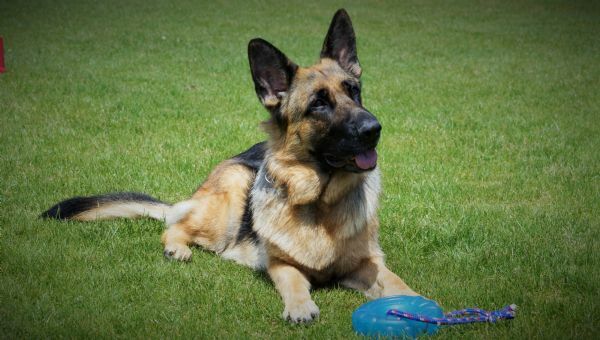 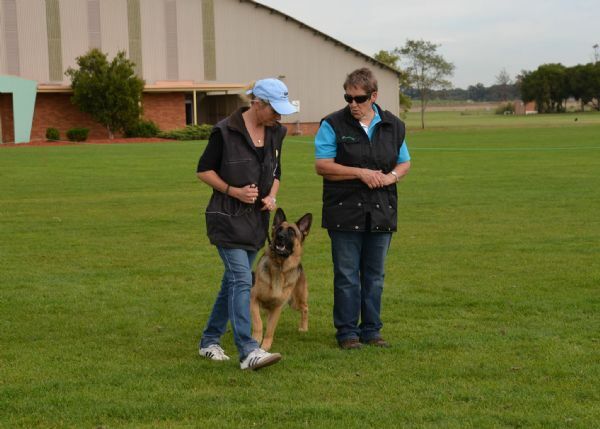 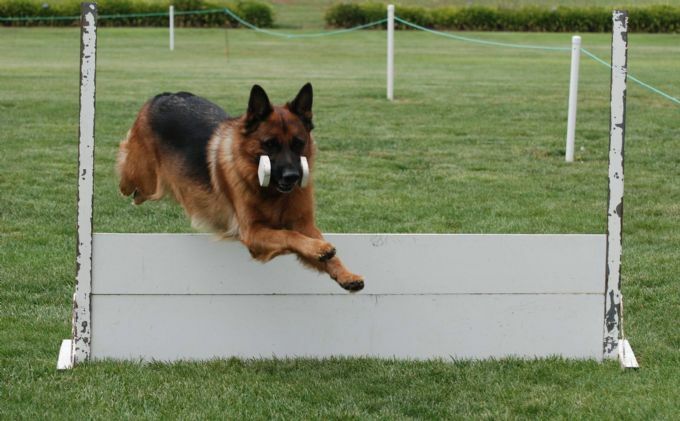 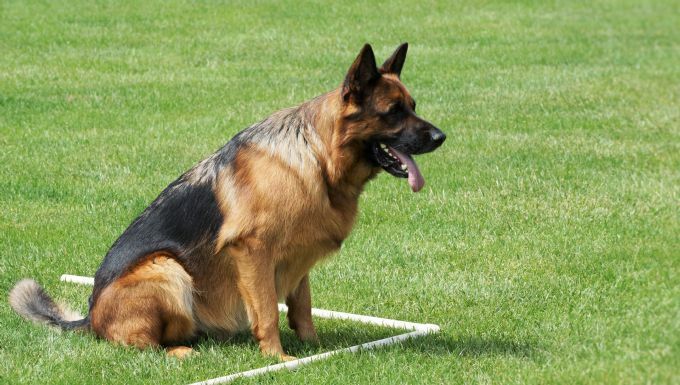 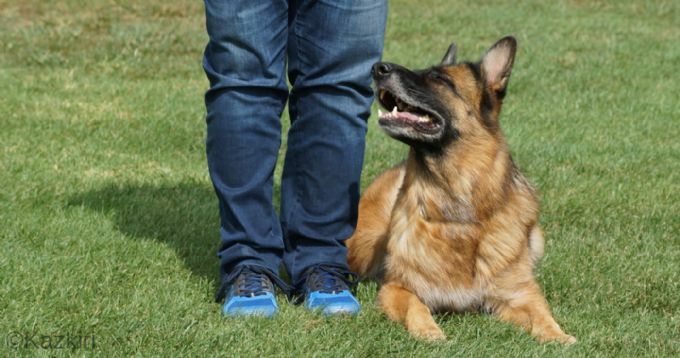 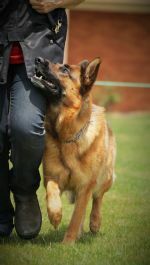 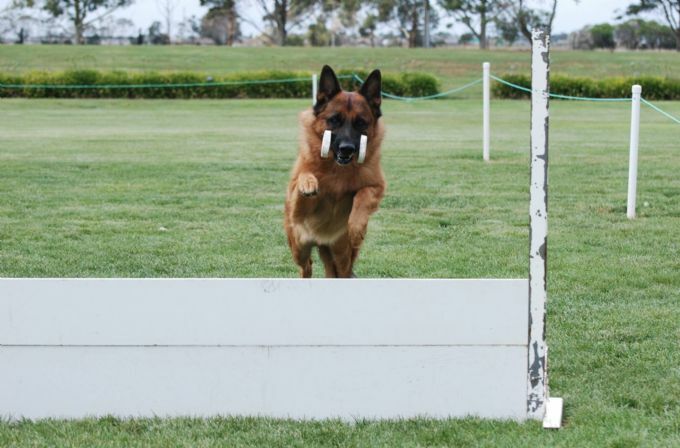 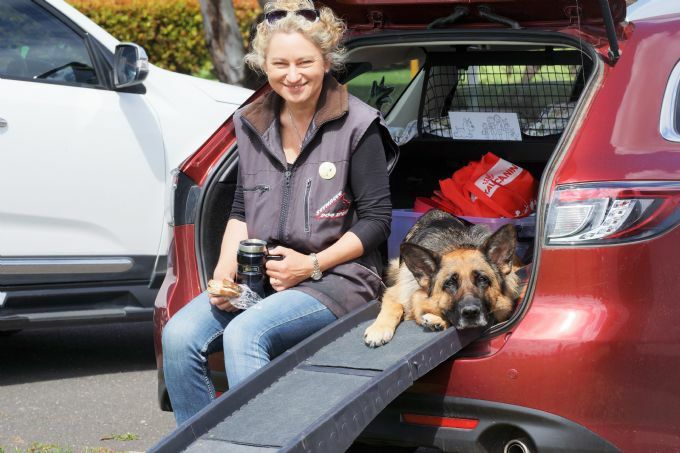 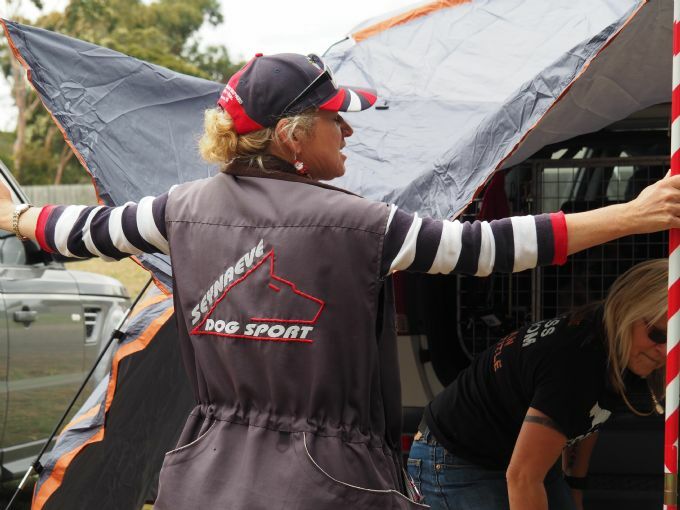 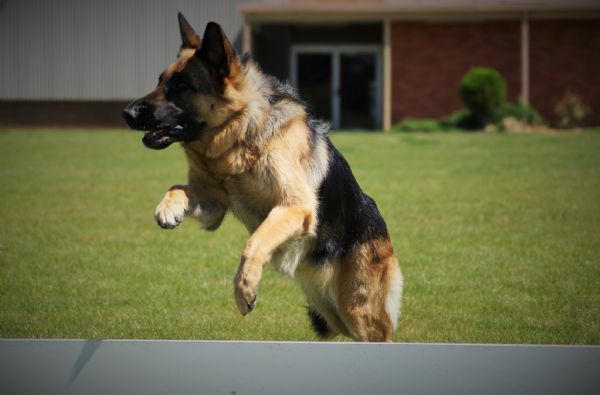 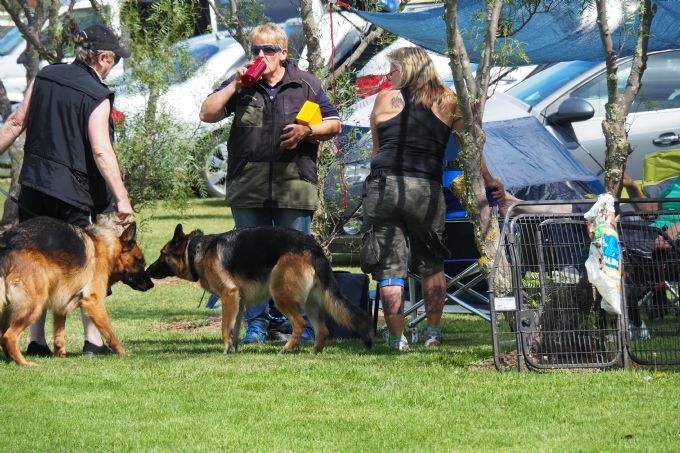 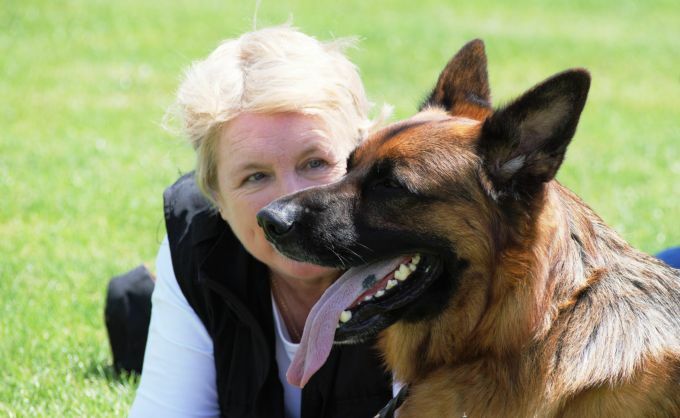 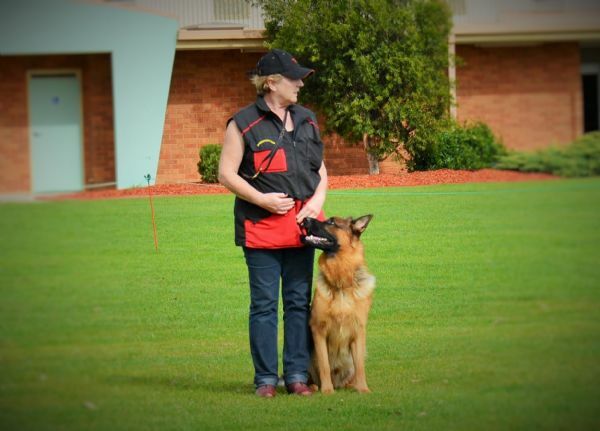 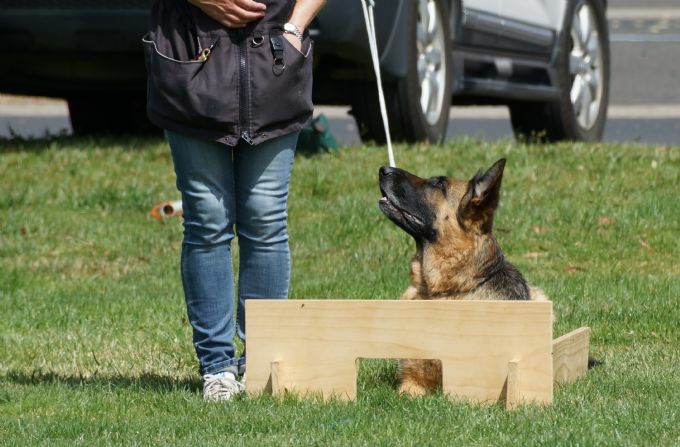 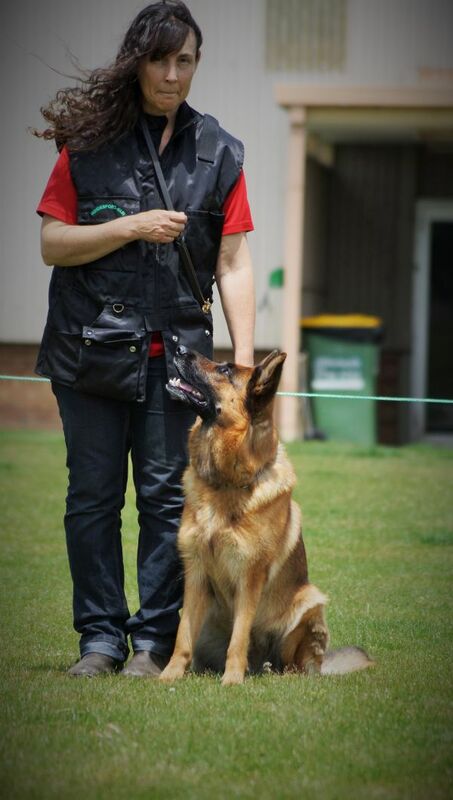 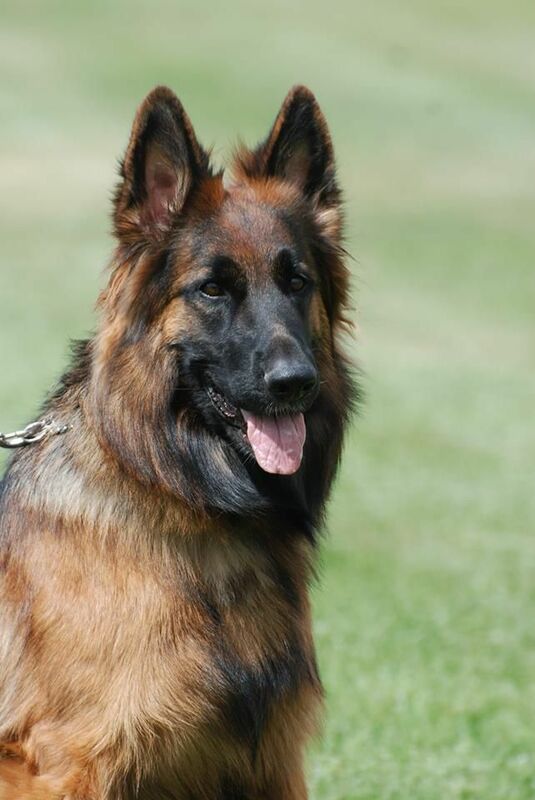 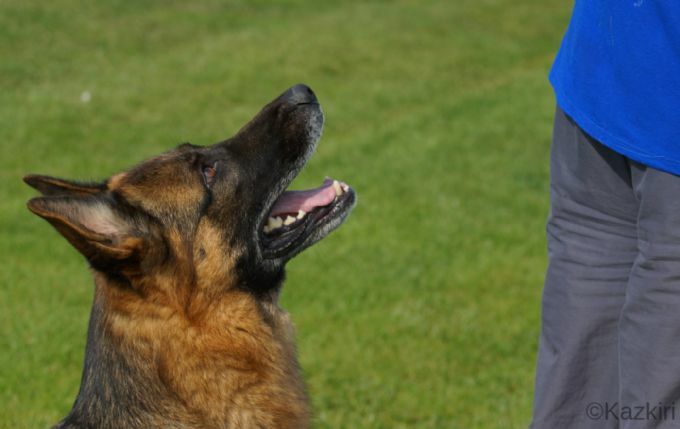 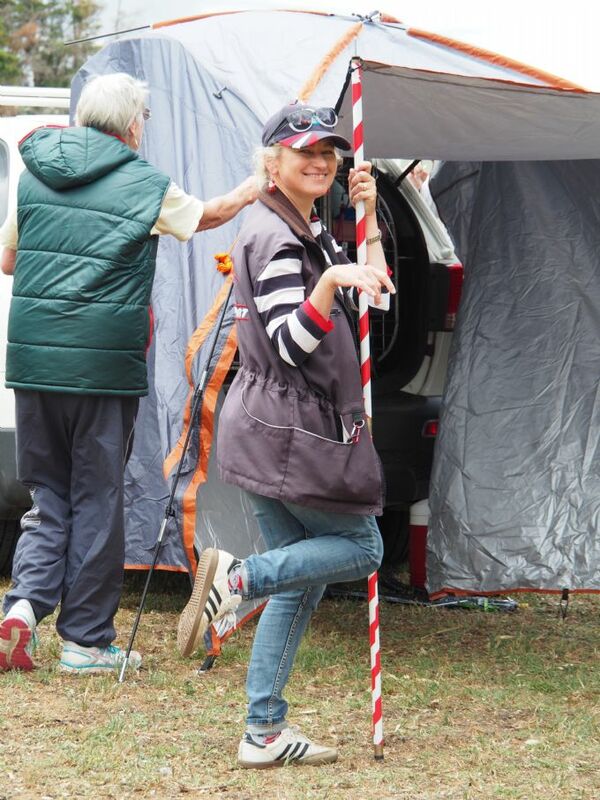 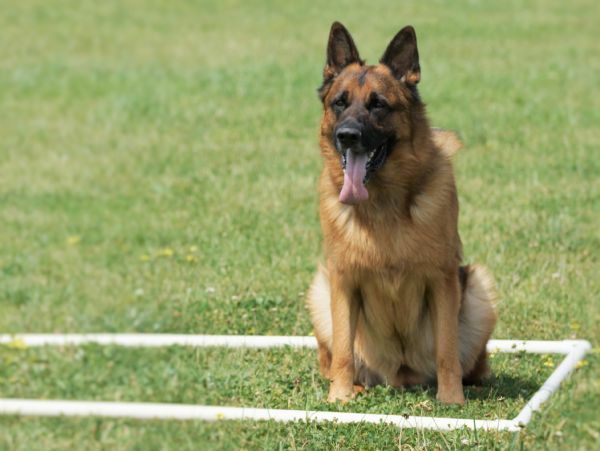 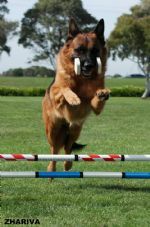 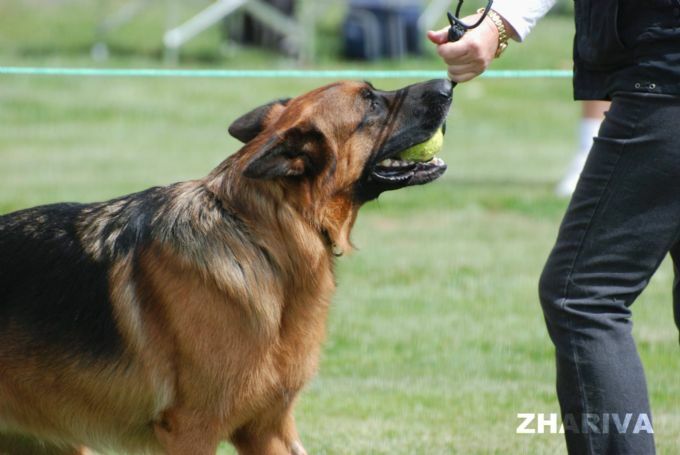 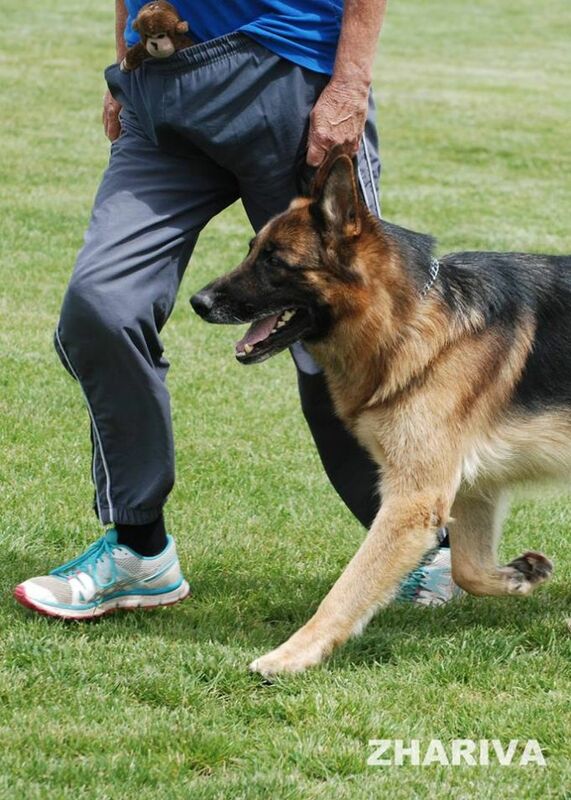 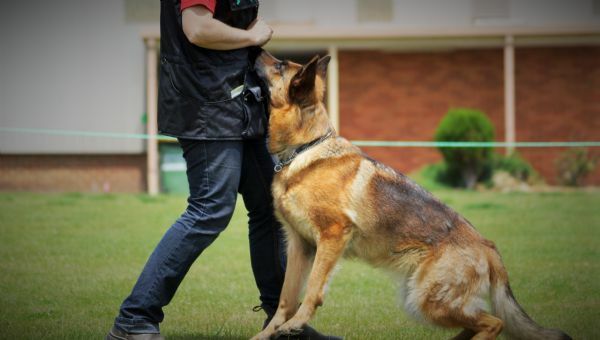 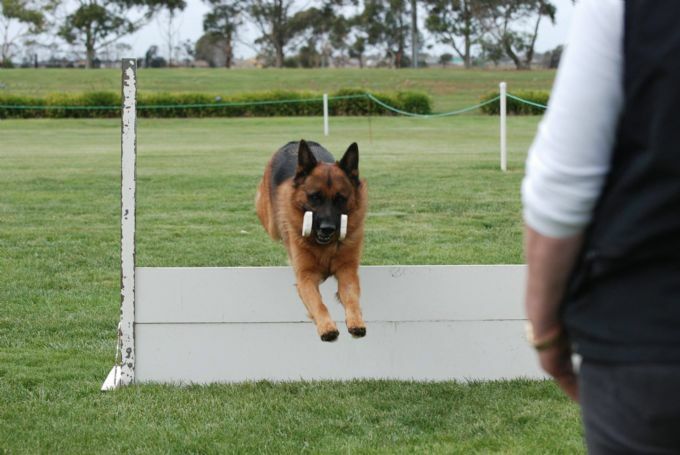 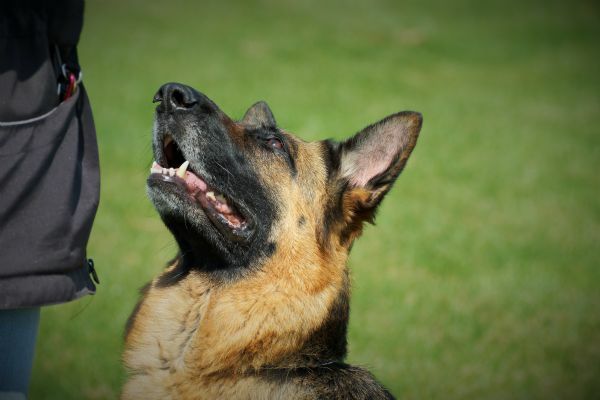 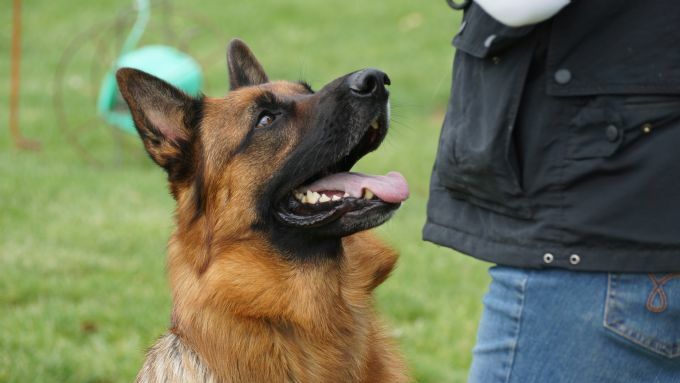 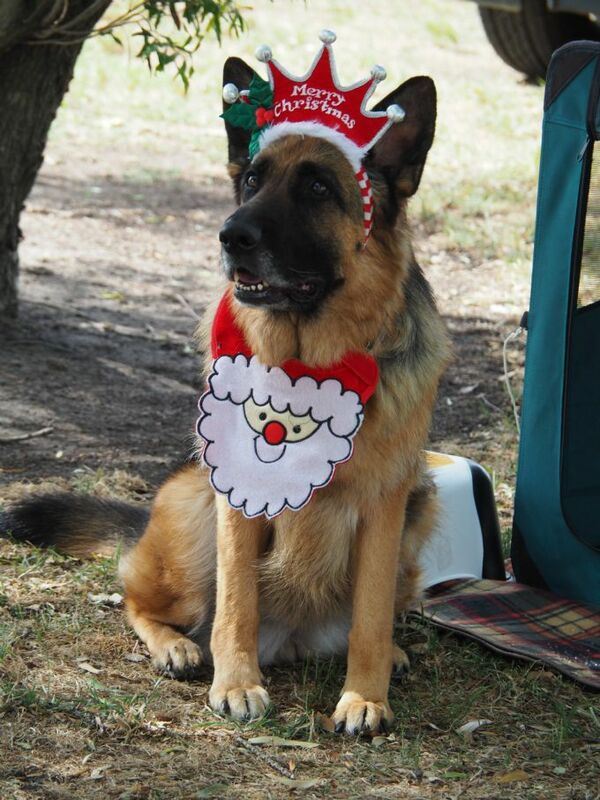 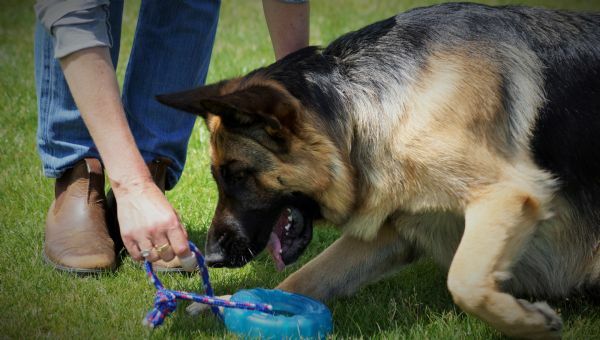 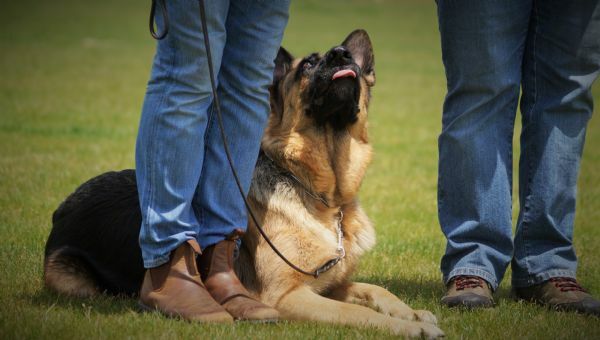 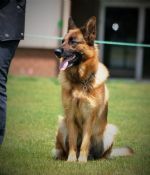 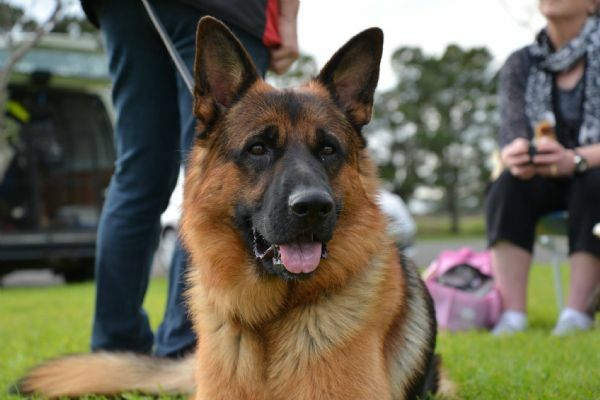 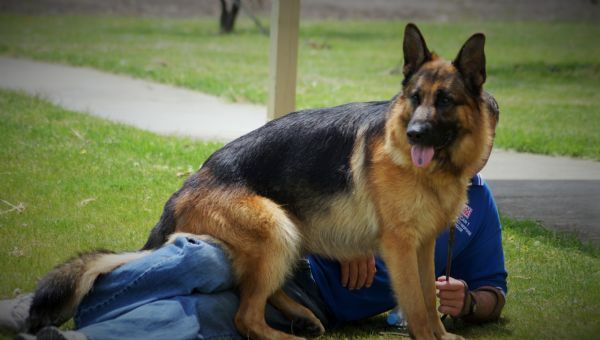 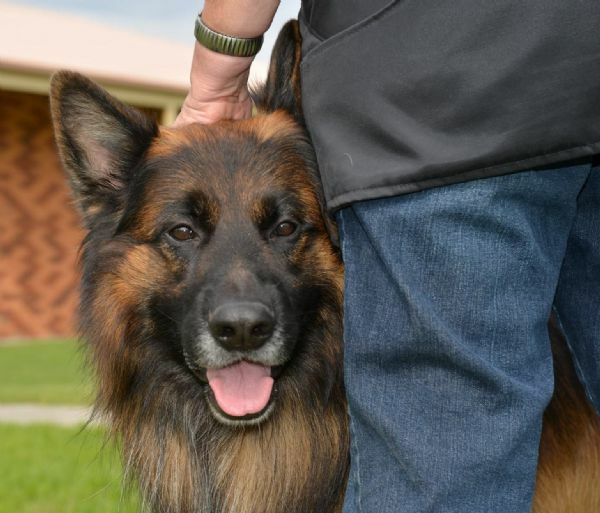 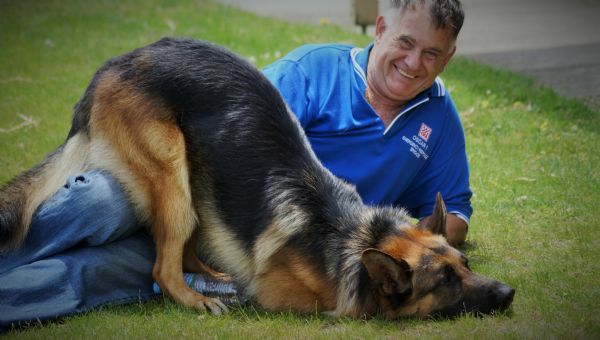 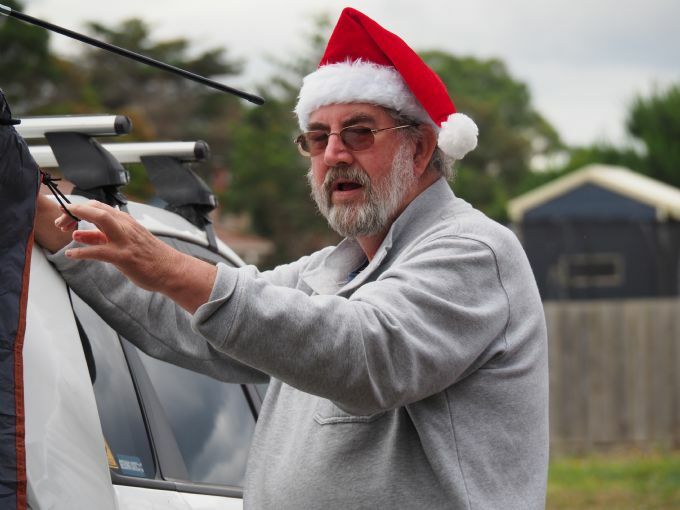 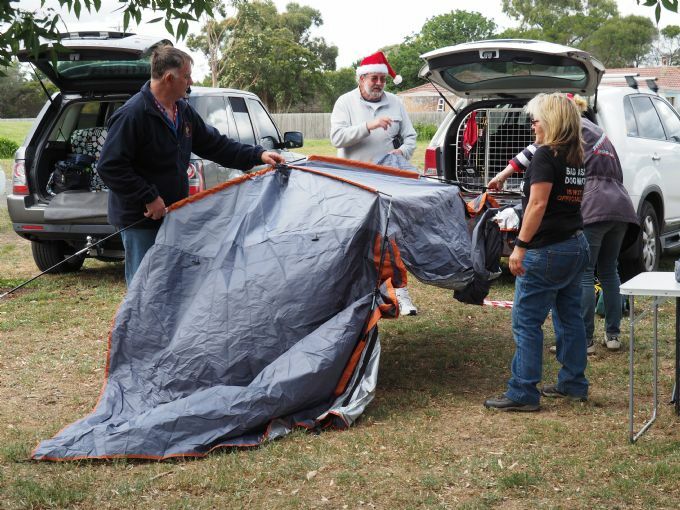 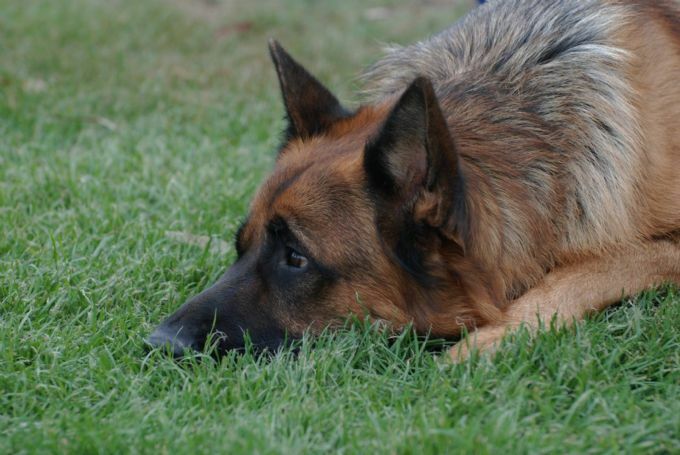 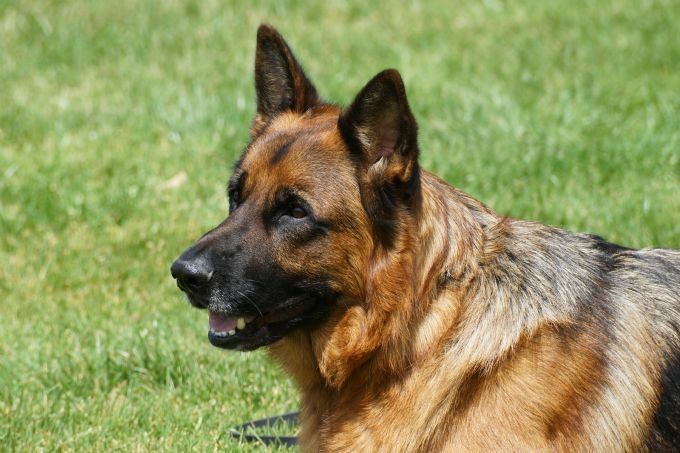 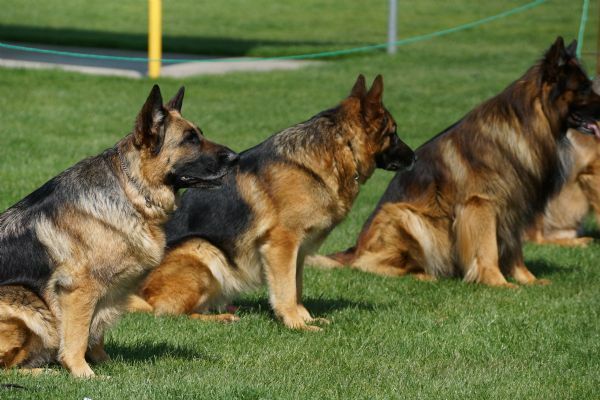 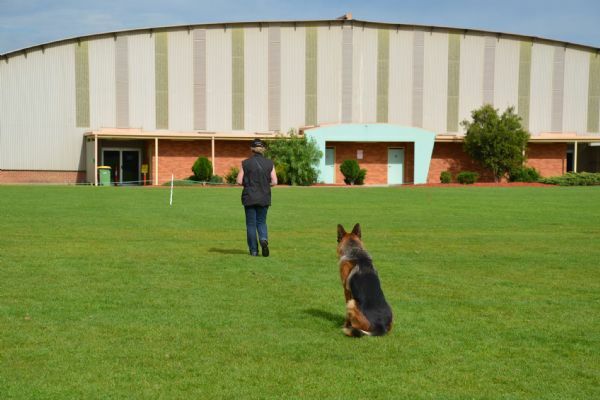 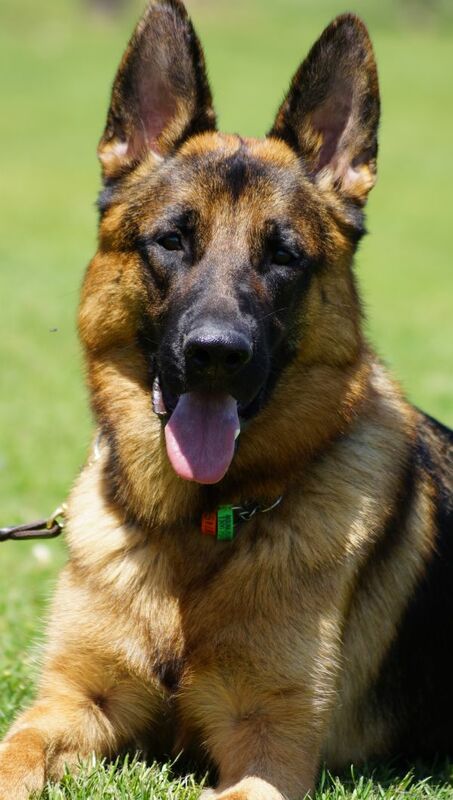 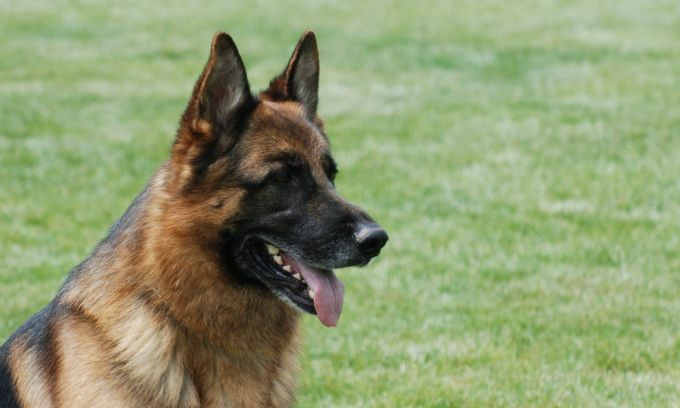 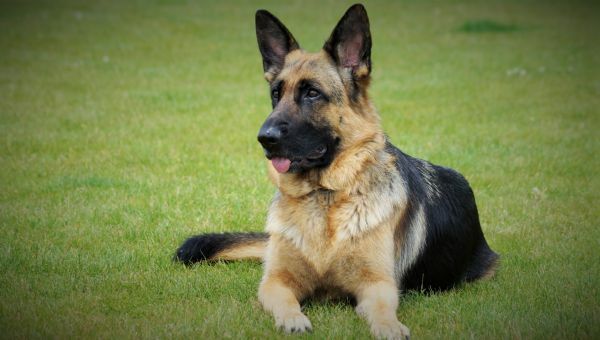 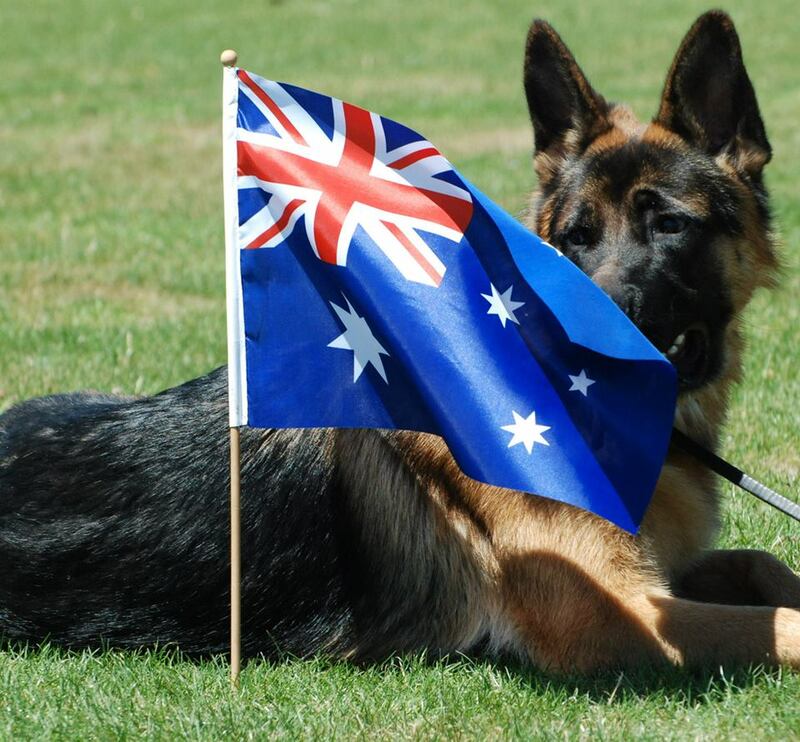 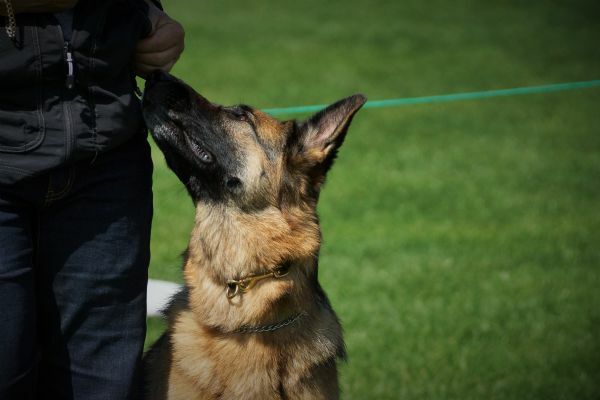 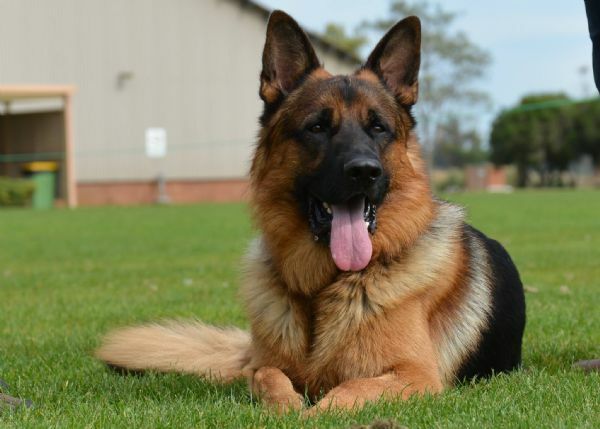 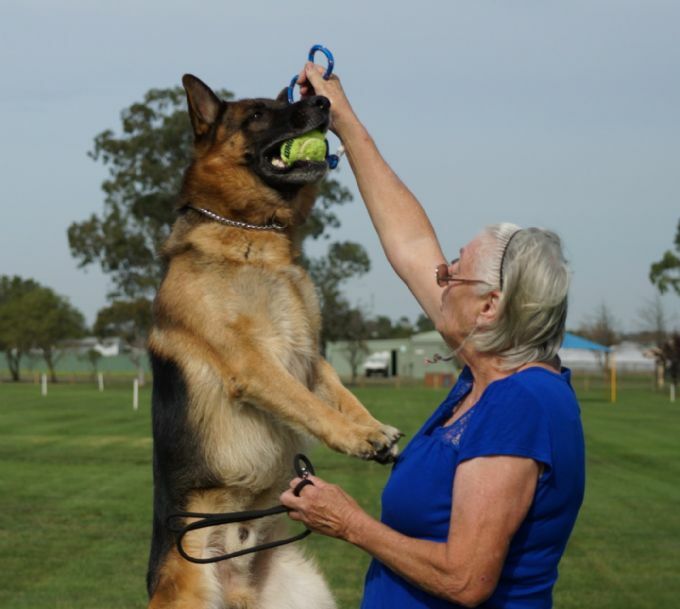 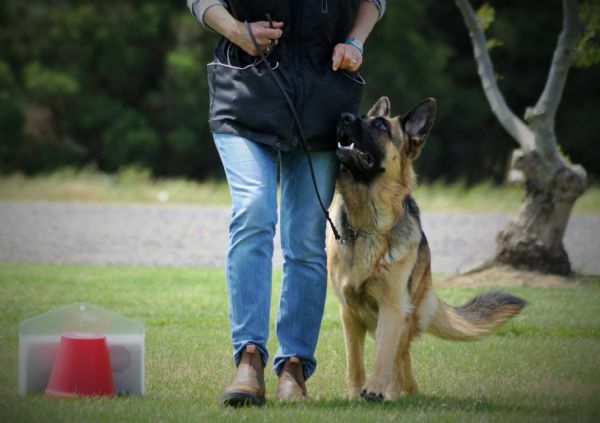 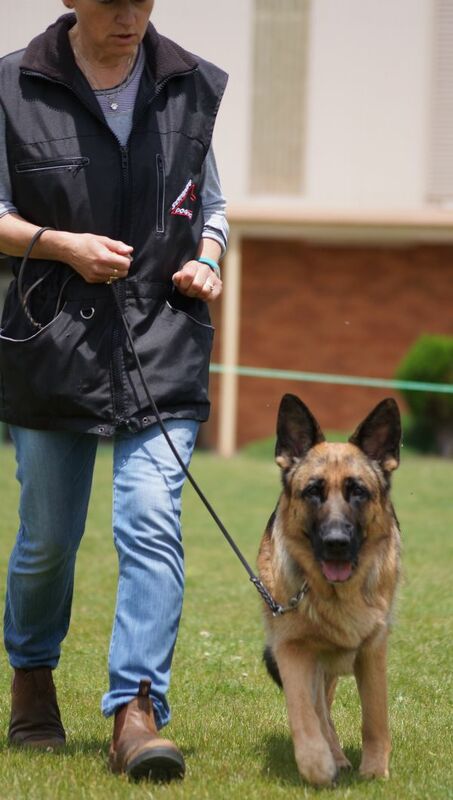 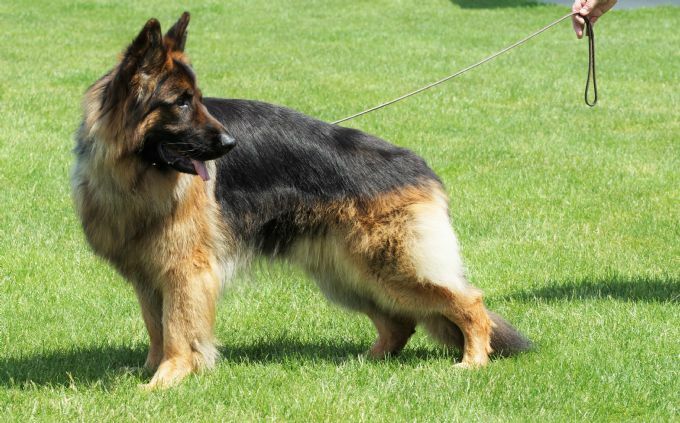 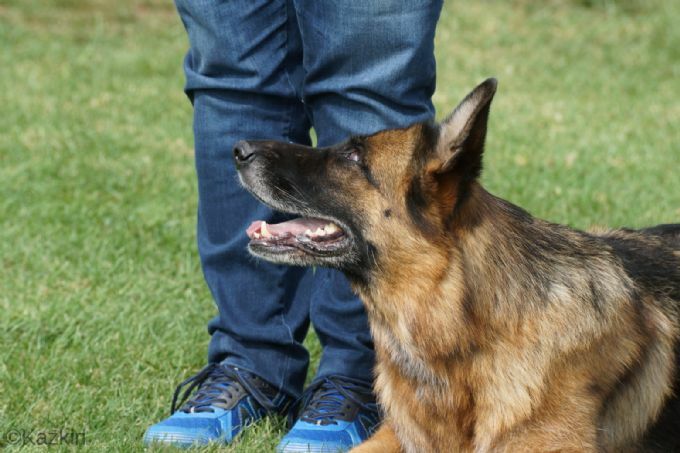 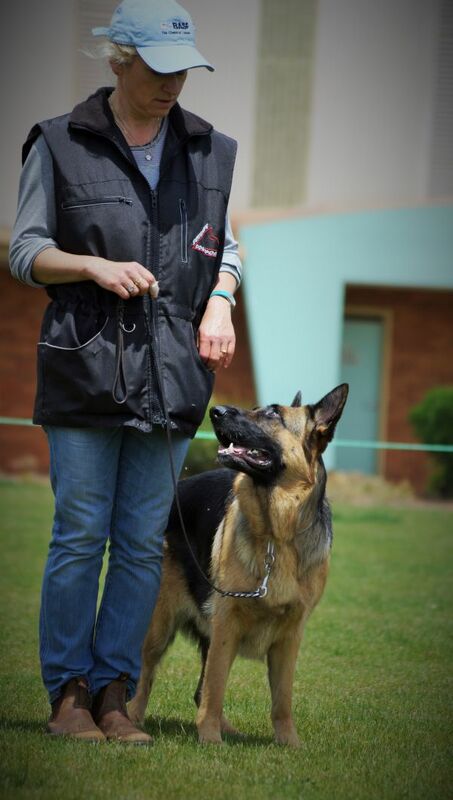 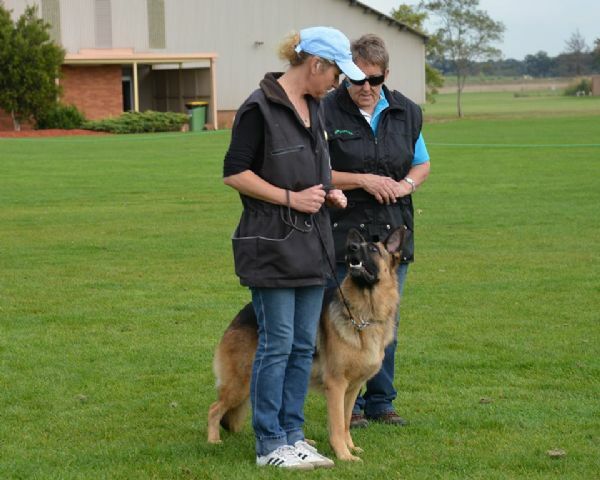 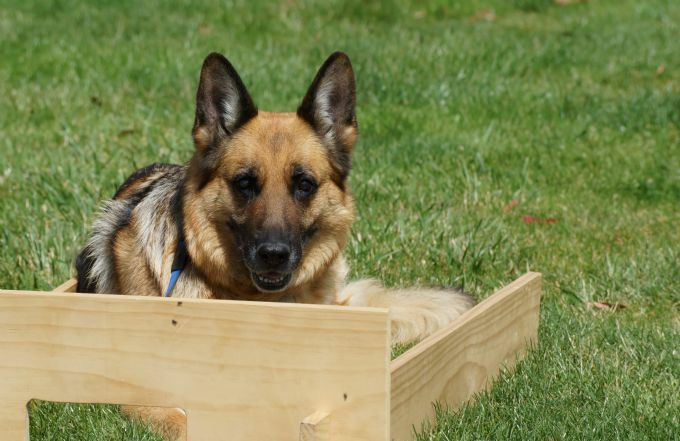 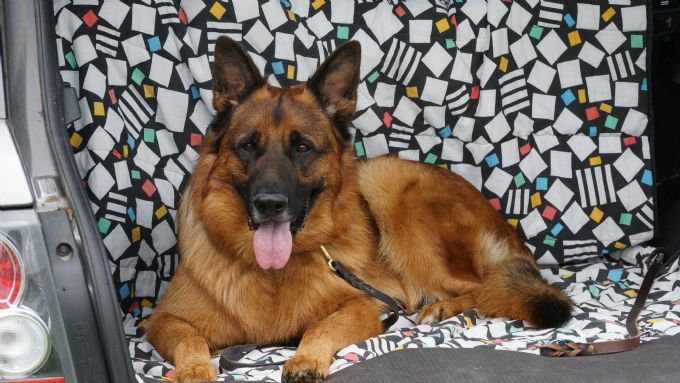 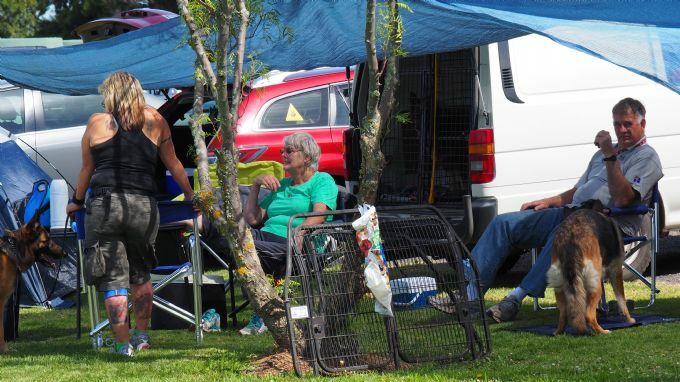 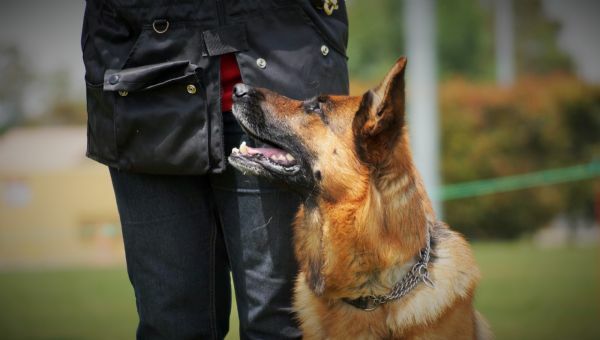 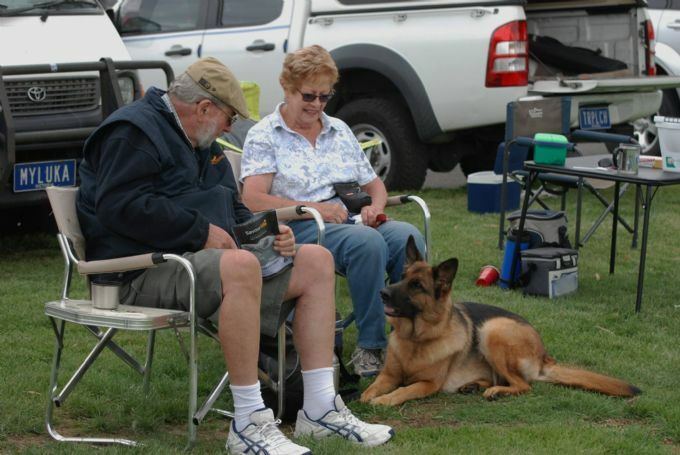 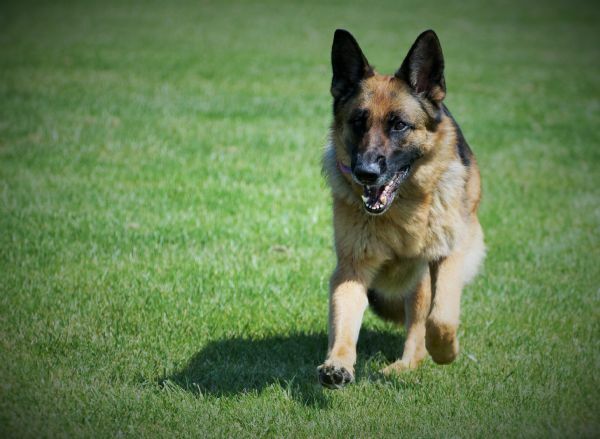 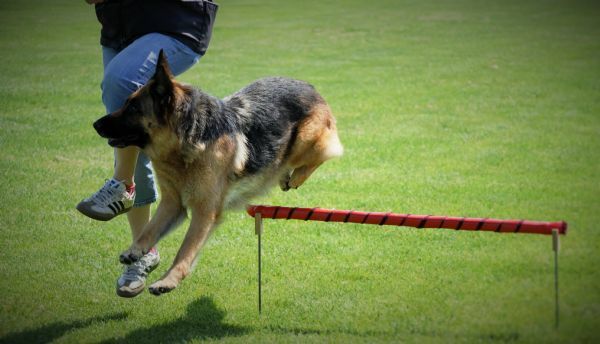 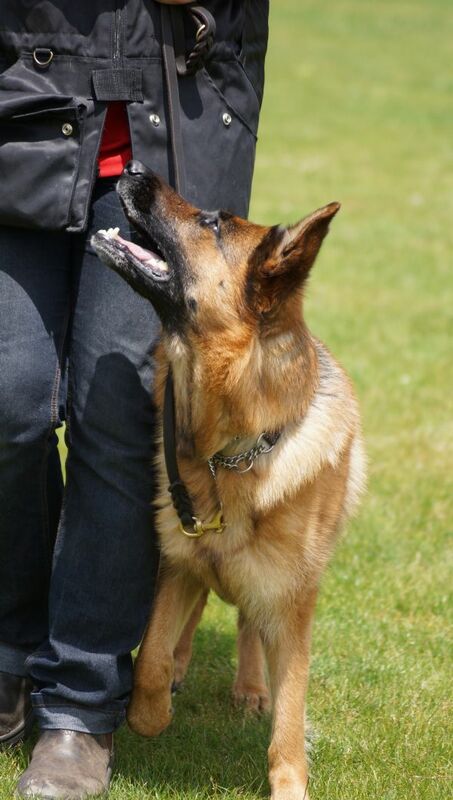 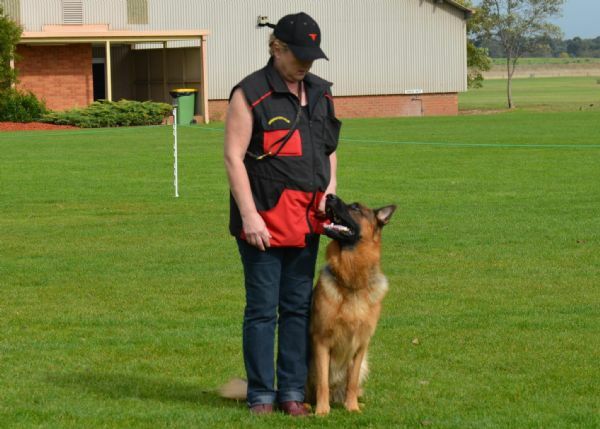 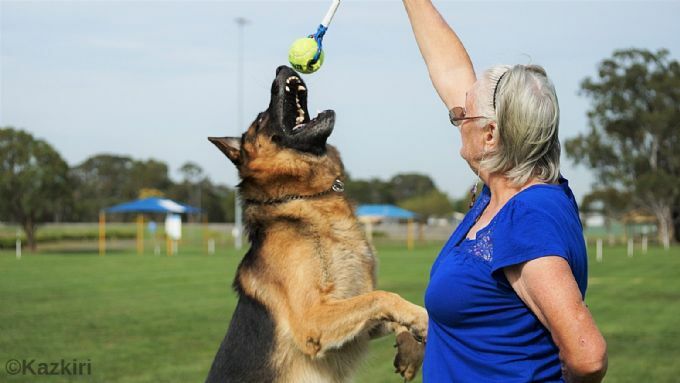 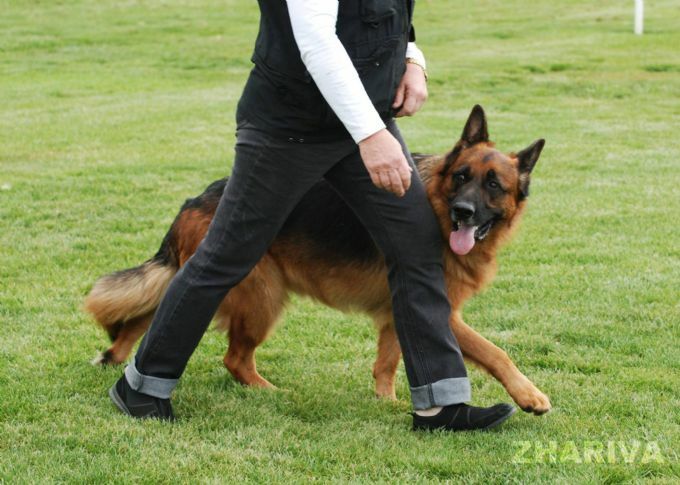 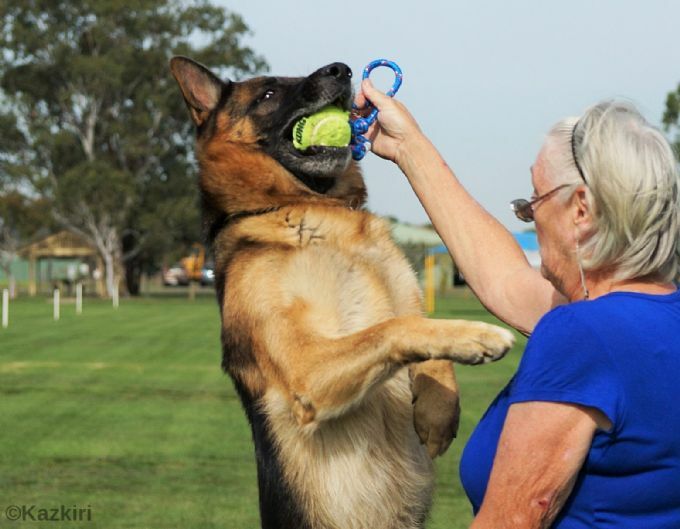 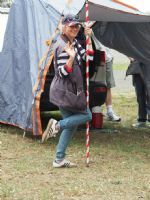 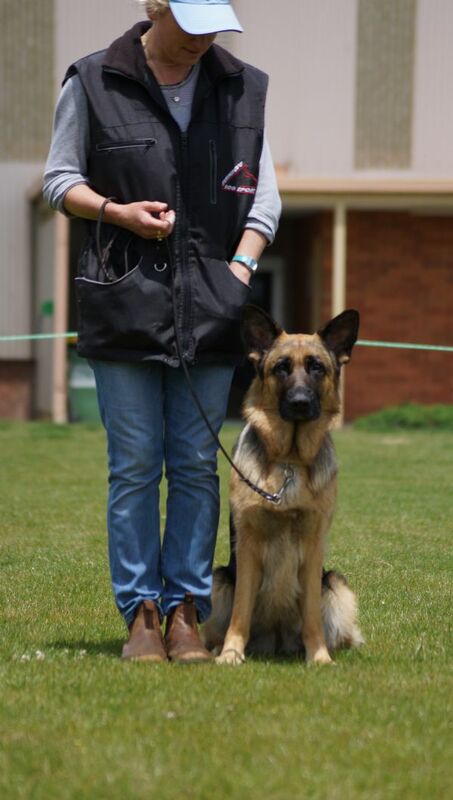 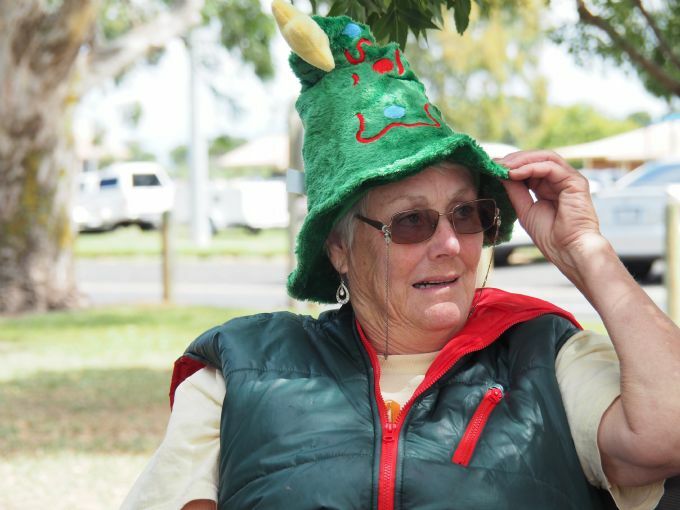 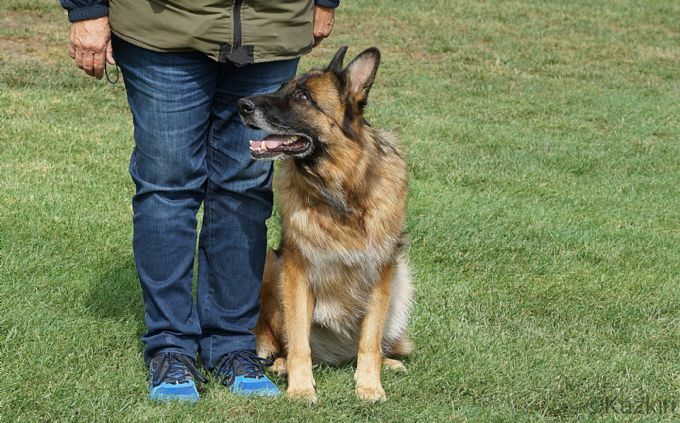 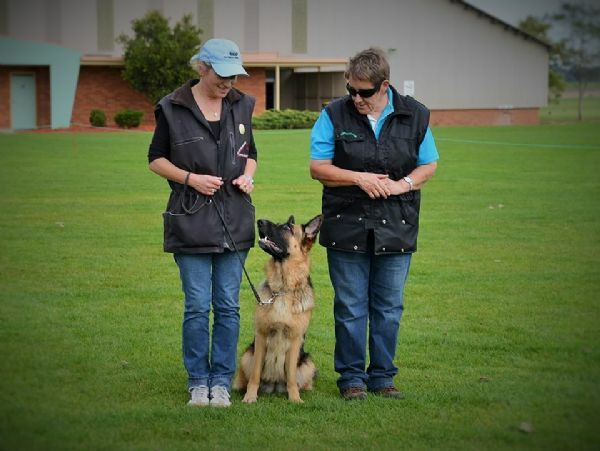 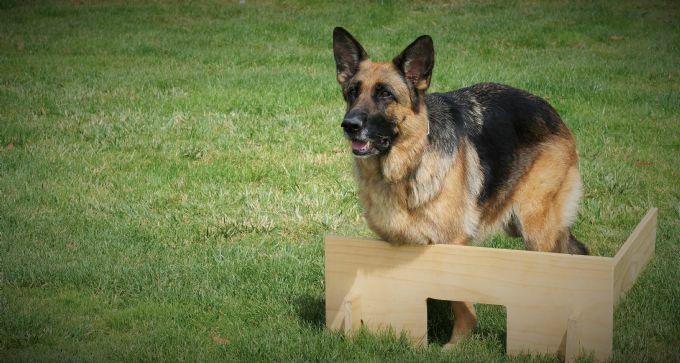 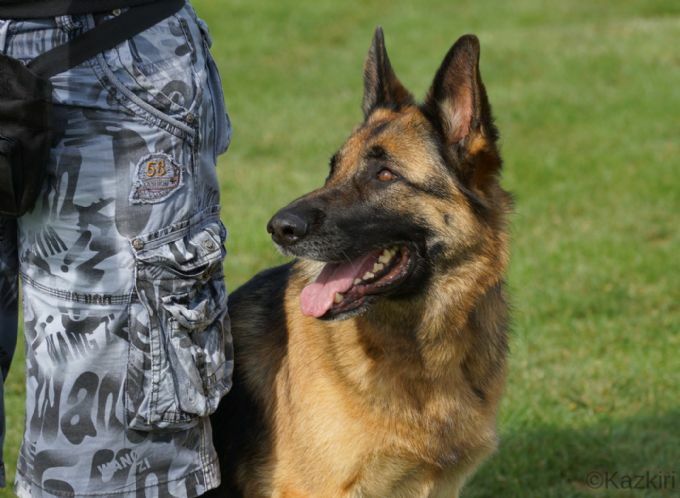 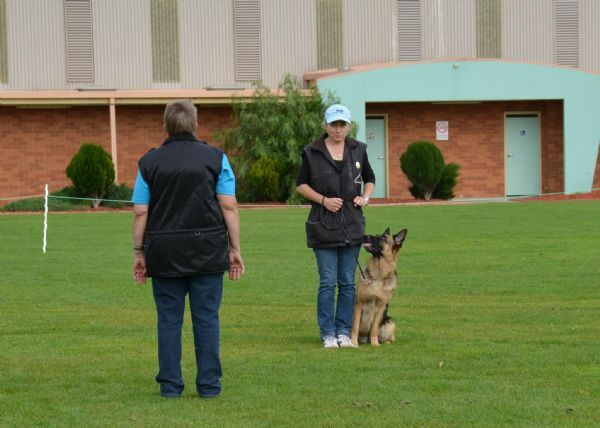 It is a good idea to train at a recognised Obedience club. 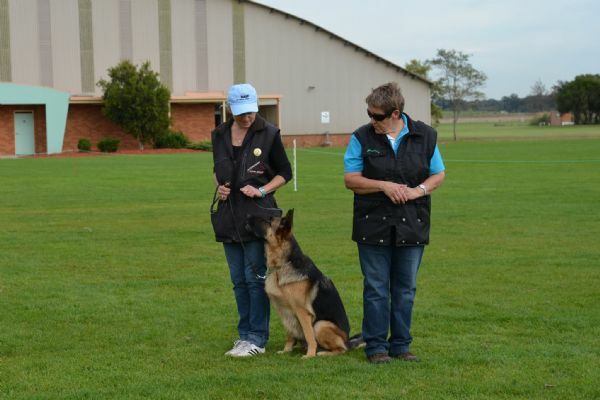 There are many excellent all-breed clubs especially in Victoria that commence puppy socialisation classes as early as 8 weeks of age. 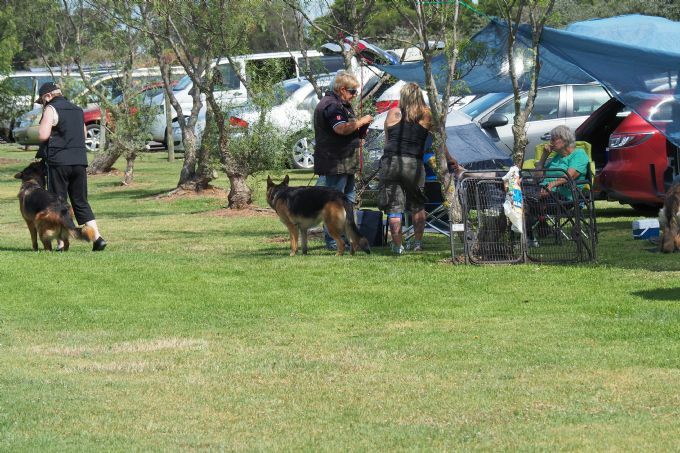 ALL puppies/dogs attending are vaccinated. 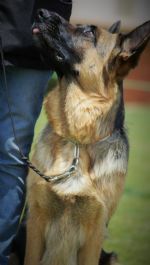 Until your pup reaches 6 months of age a light collar & lead should be used, after that a correction chain can be used. 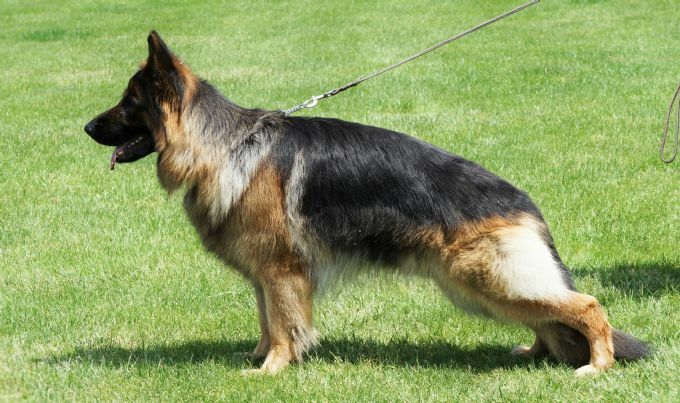 NEVER tie a dog up when wearing a correction chain. 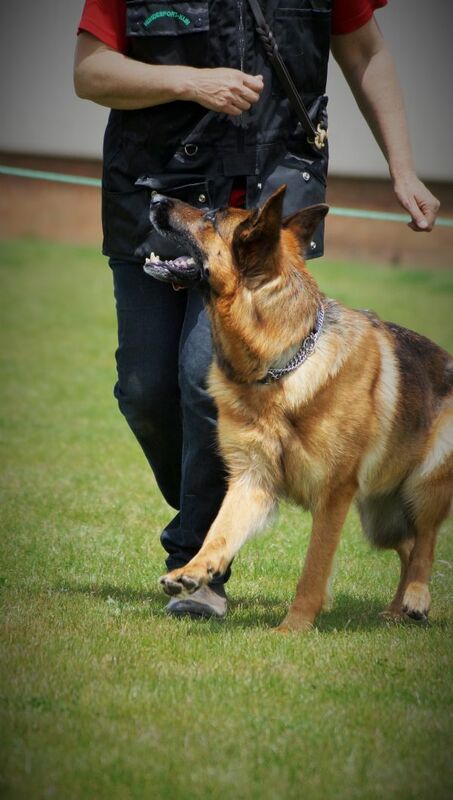 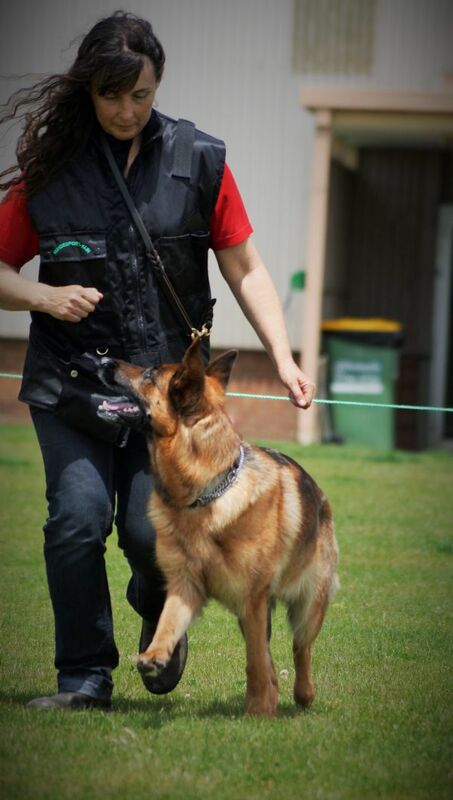 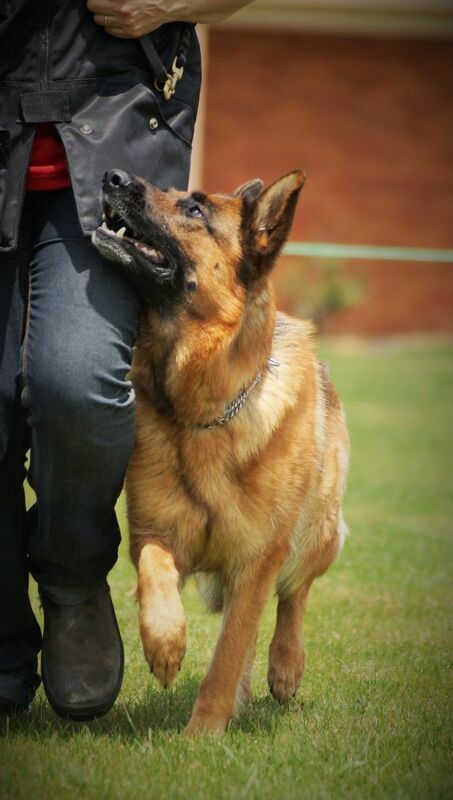 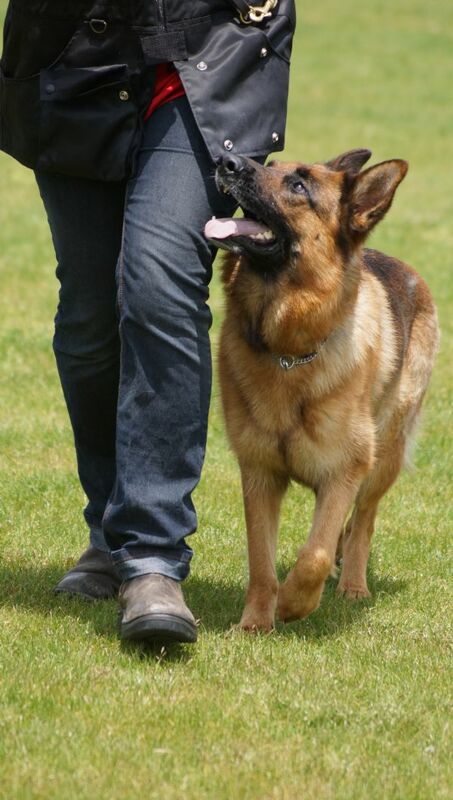 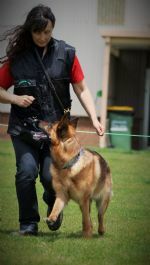 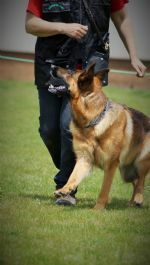 This scenario - an unruly young male dog with a female handler who is not very assertive - is one that most instructors have come across. 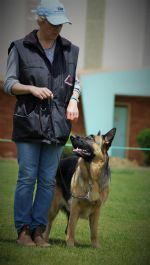 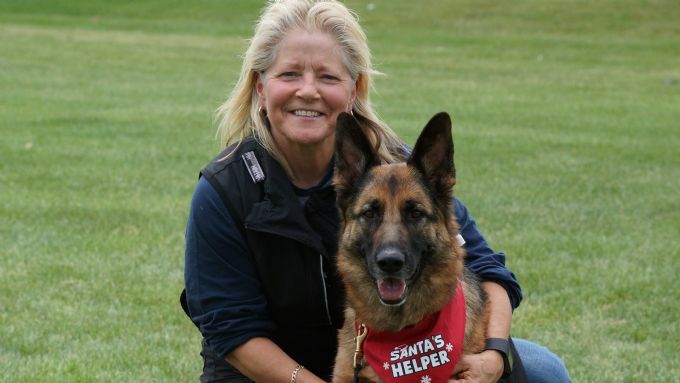 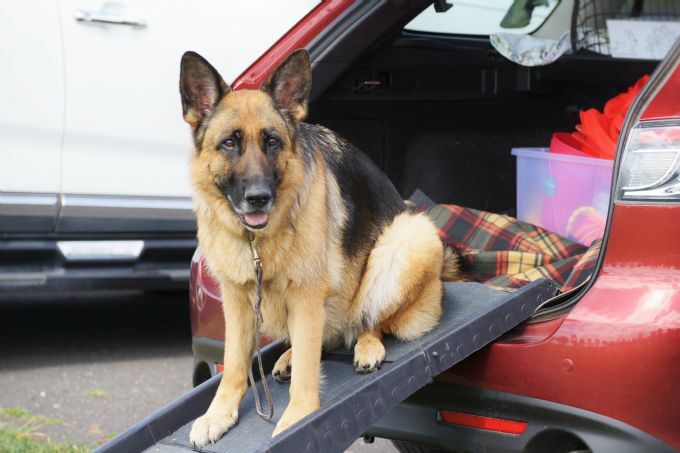 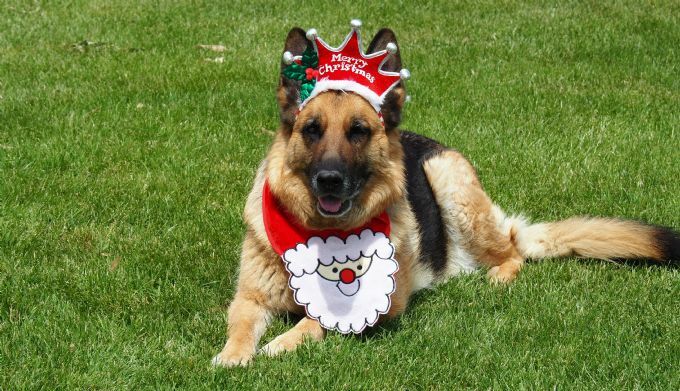 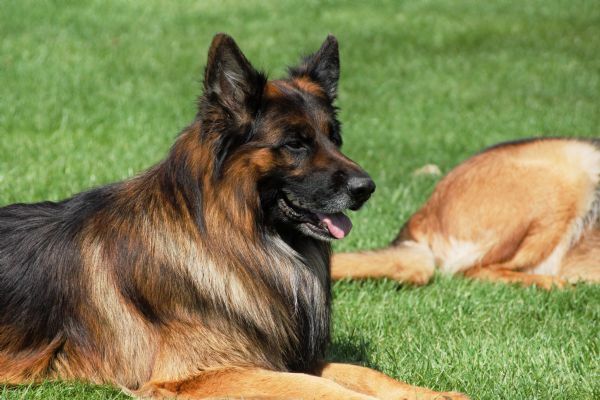 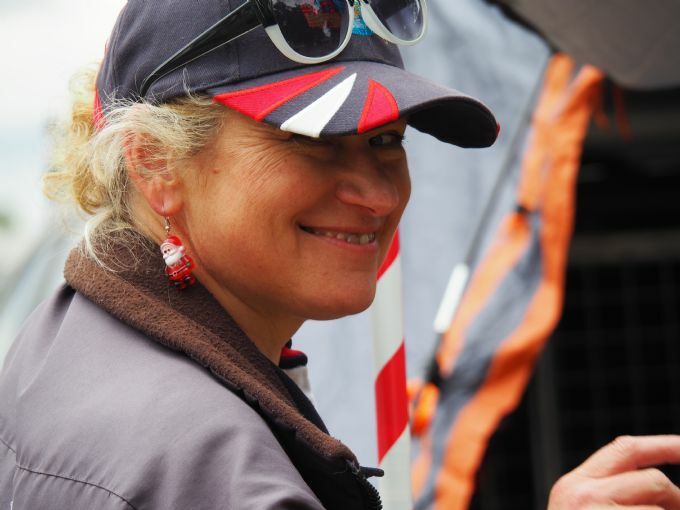 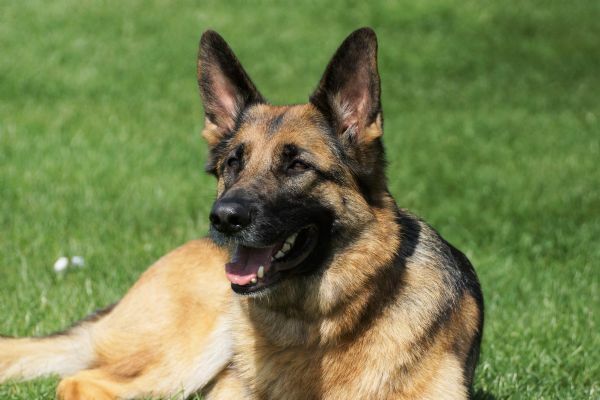 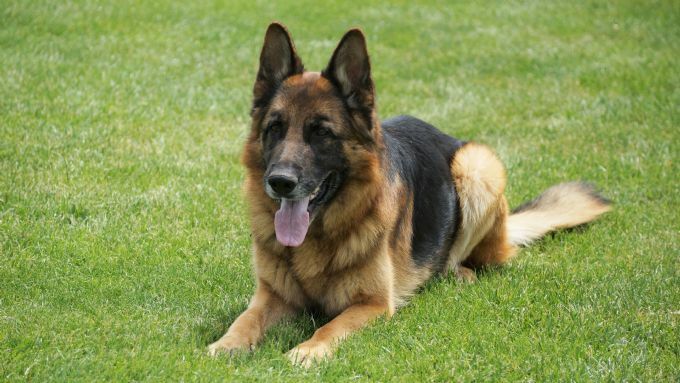 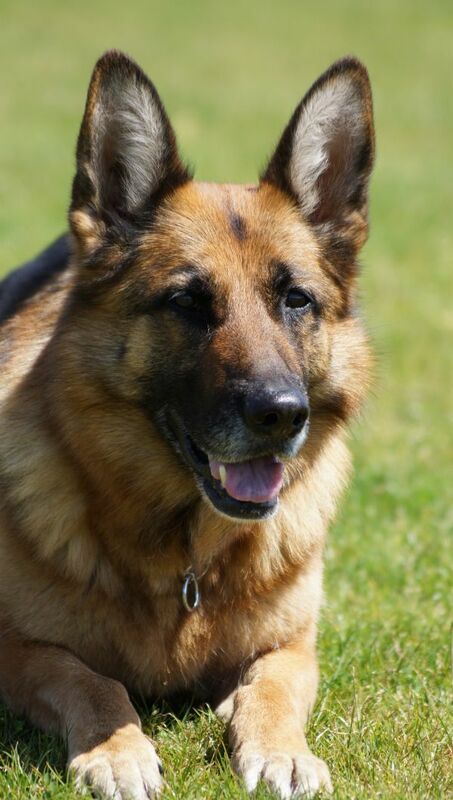 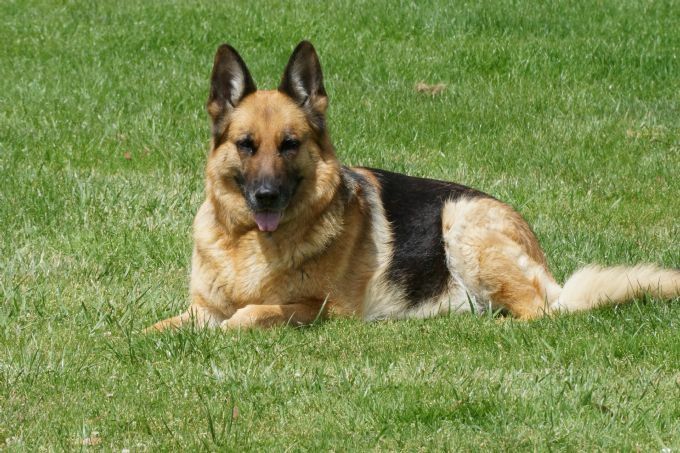 How can we help the owner to assert herself and deal with her dog? 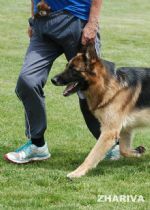 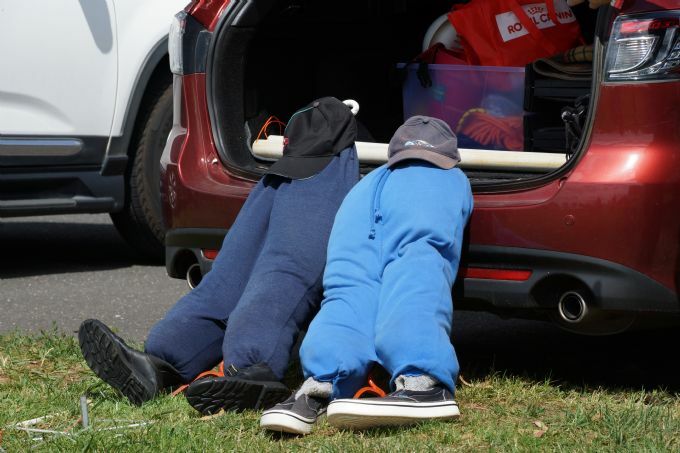 Welcome to the Training Photo Album.